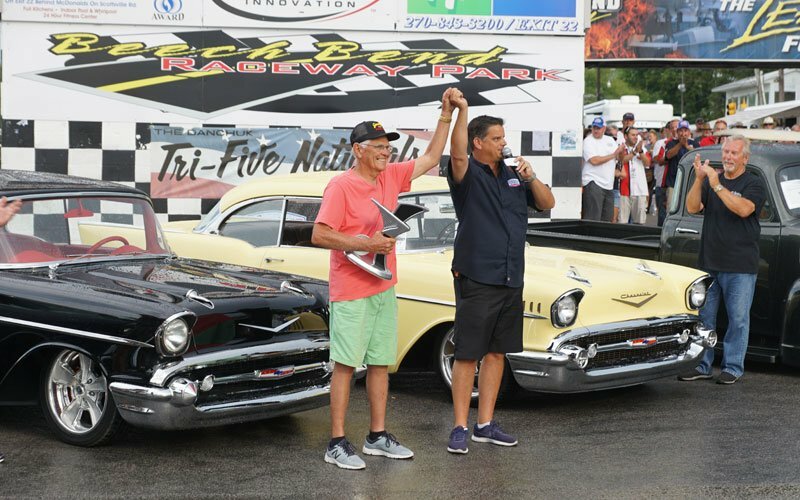 Danchuk and Woody’s Hot Rods announced the Tri-Five of the Year winner here at the Tri-Five Nationals 2018. 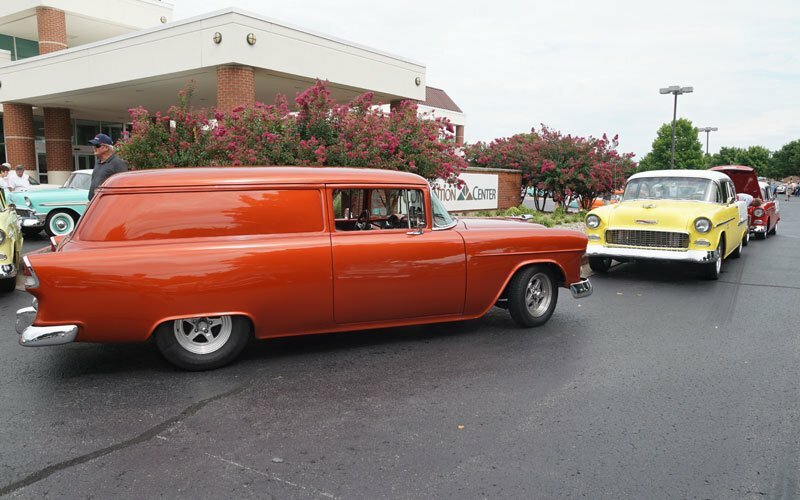 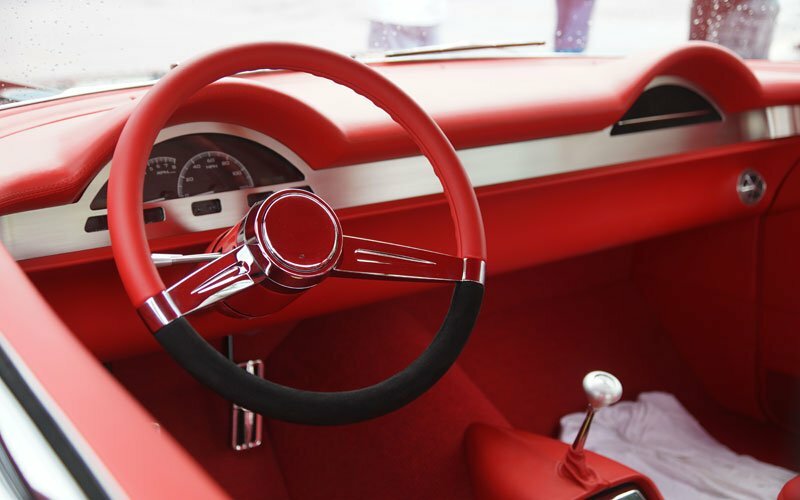 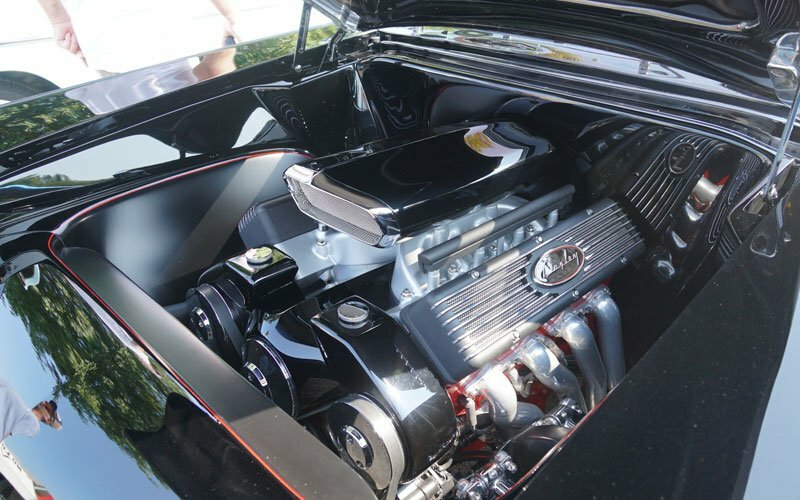 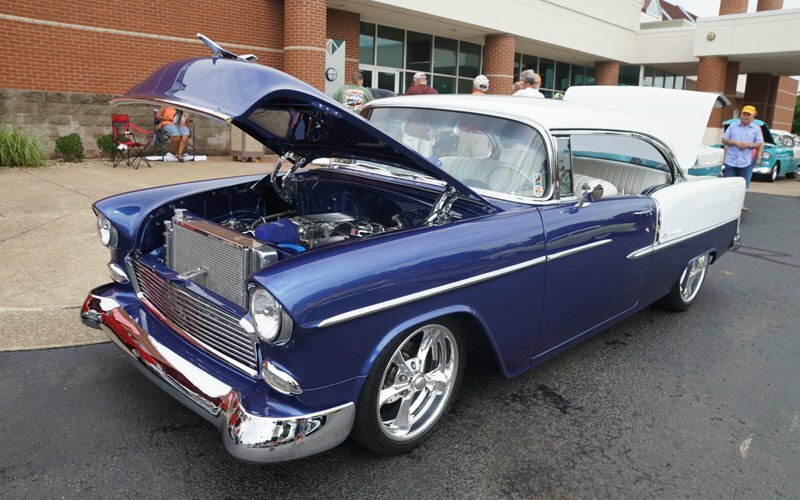 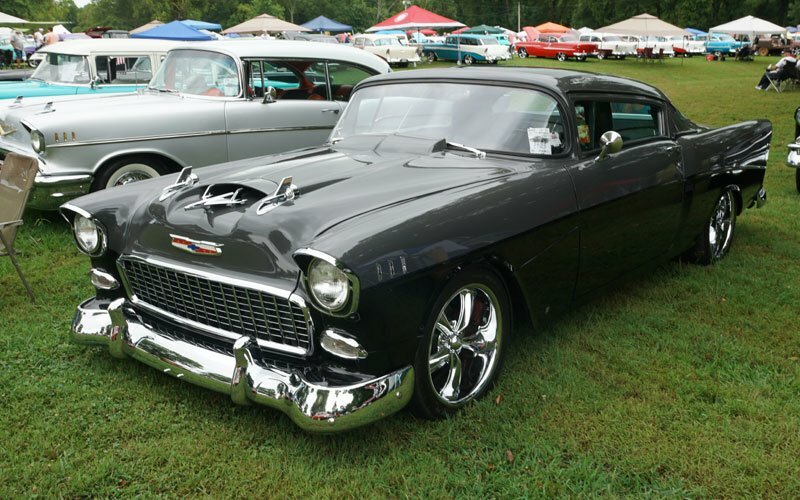 Charles Baxley of N. Augusta, South Carolina took the top honors for his 1957 Chevy Classic Custom. 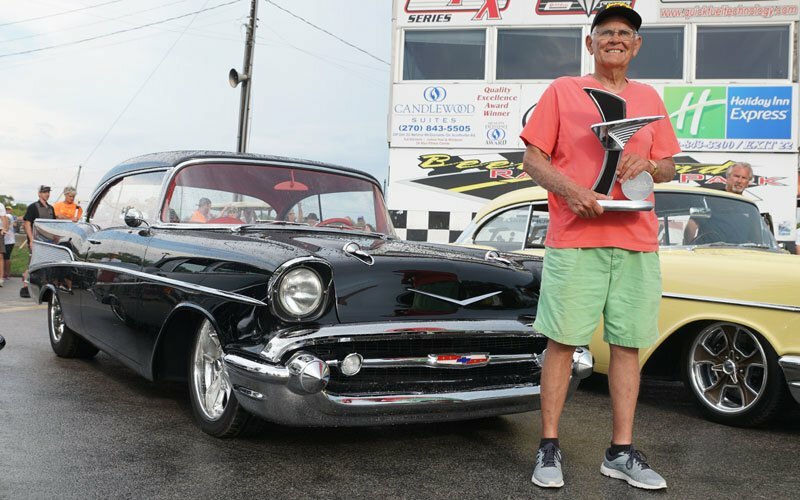 The awards ceremony took place in the Winners Circle today at Beach Bend Raceway where the Tri-Five Nationals 2018 was held. 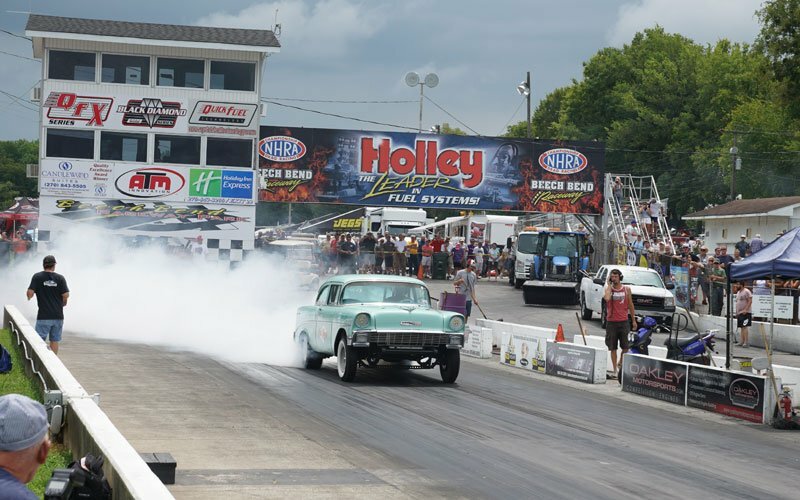 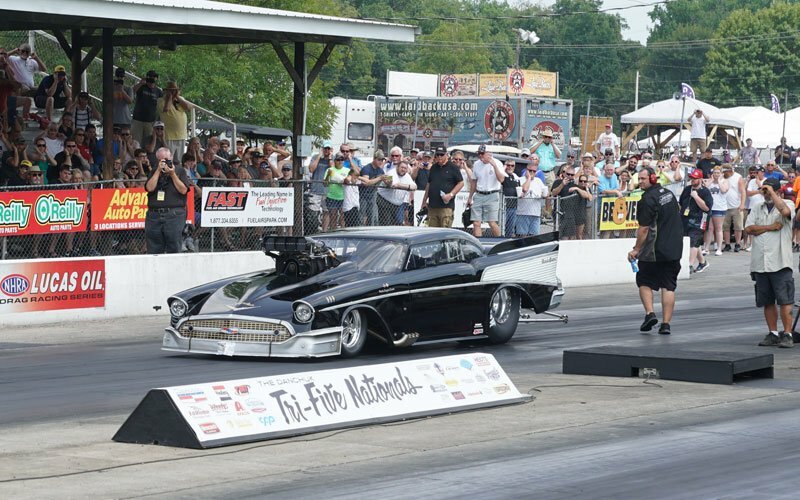 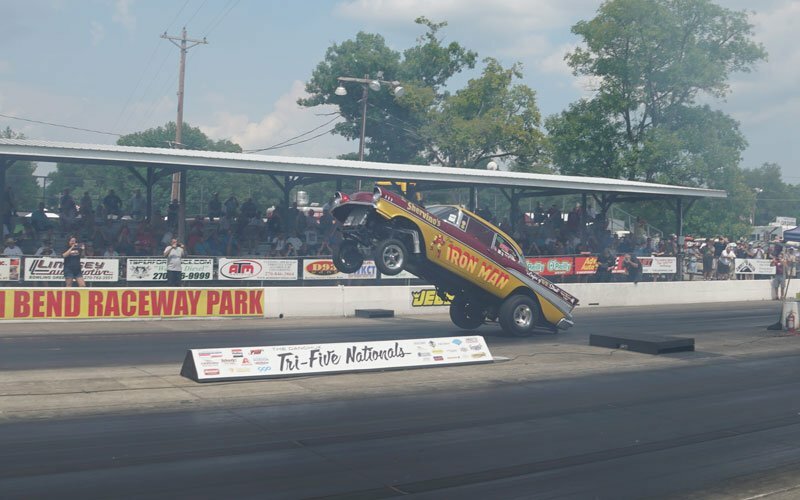 Awards ceremonies for the top show cars here at the Tri-Five Nationals 2018 were the main event here in Bowling Green, Kentucky today. 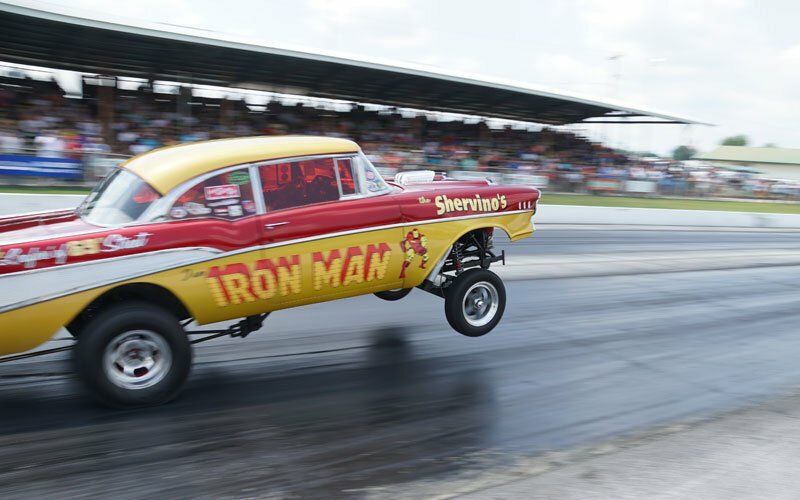 The drag racing events really got exciting with the wheelstanders putting on a good show. 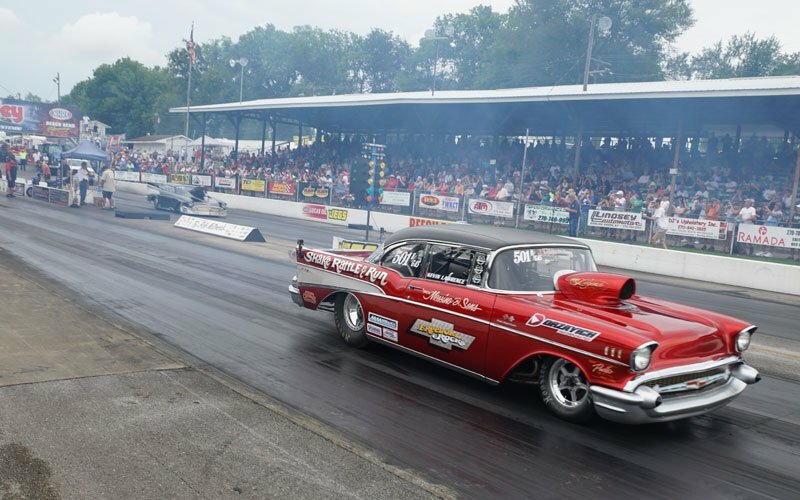 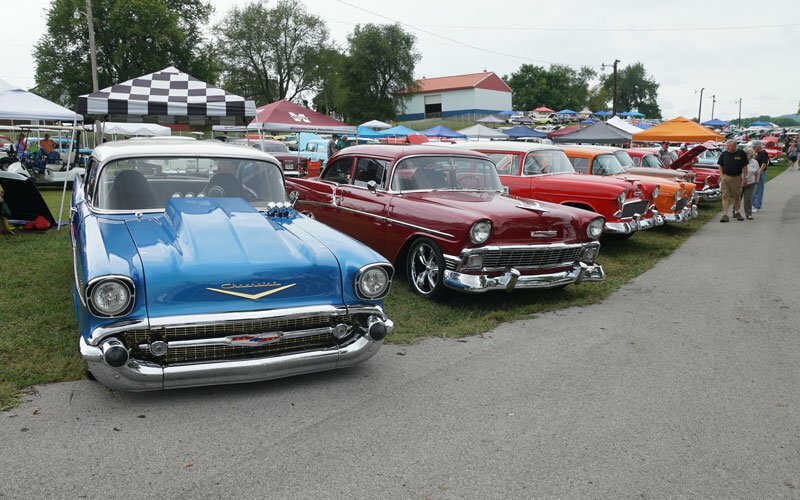 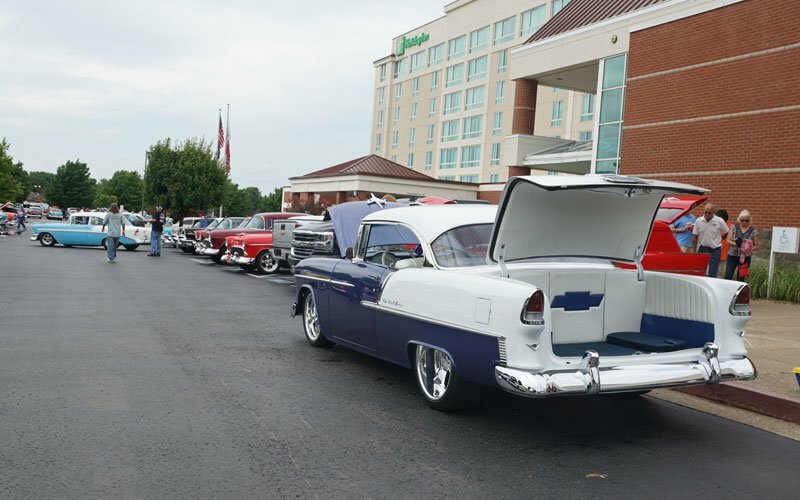 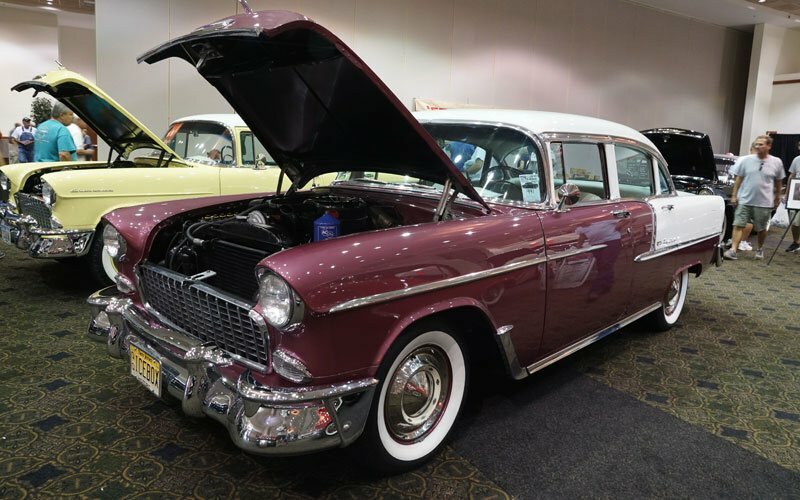 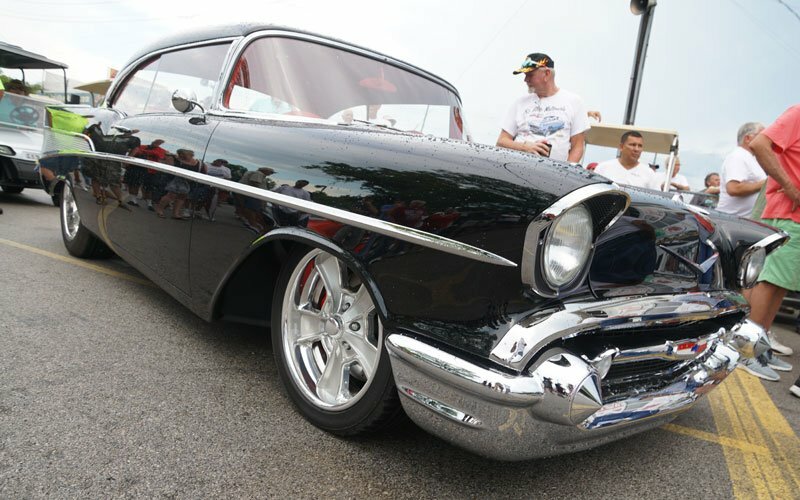 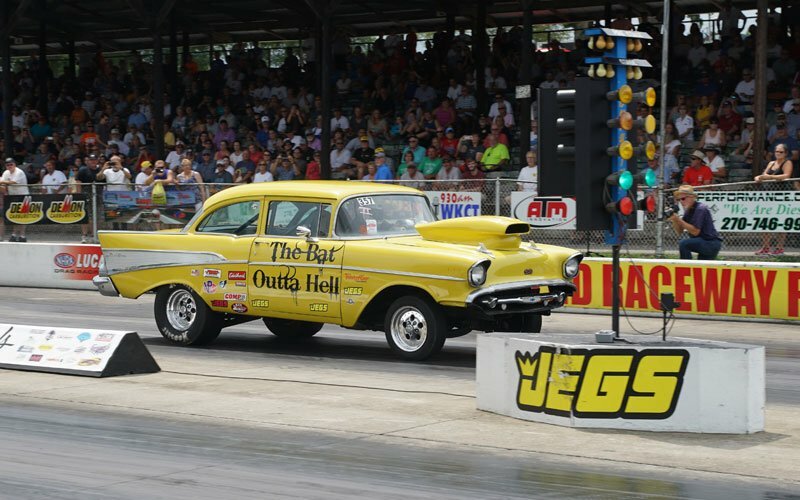 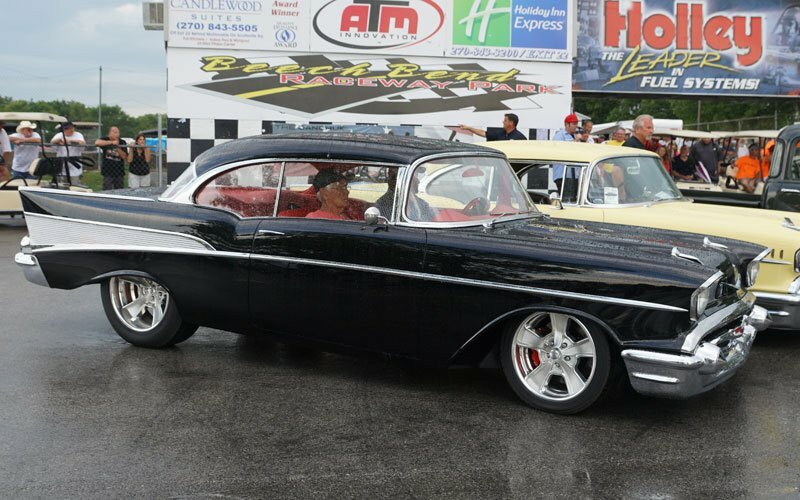 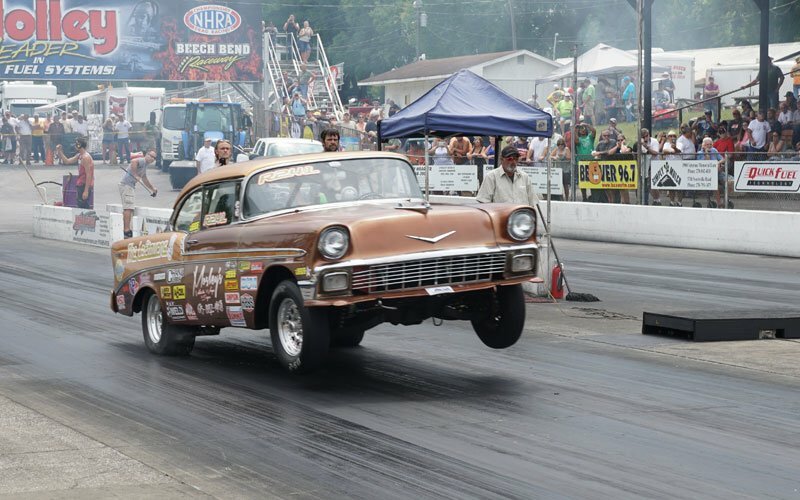 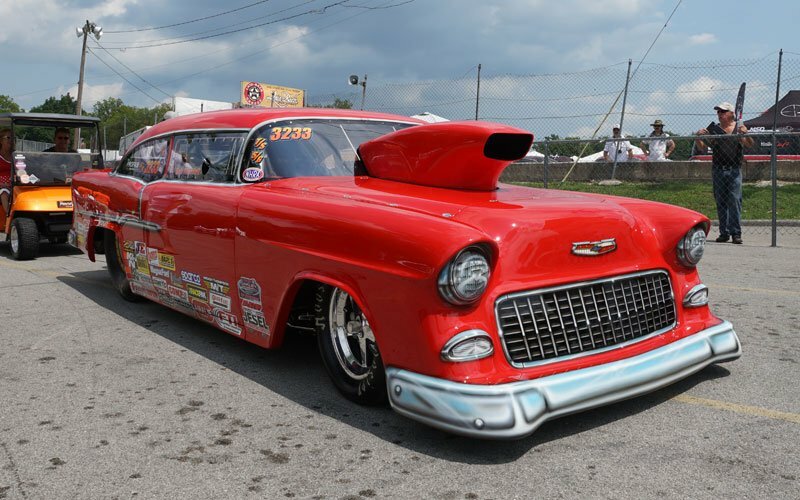 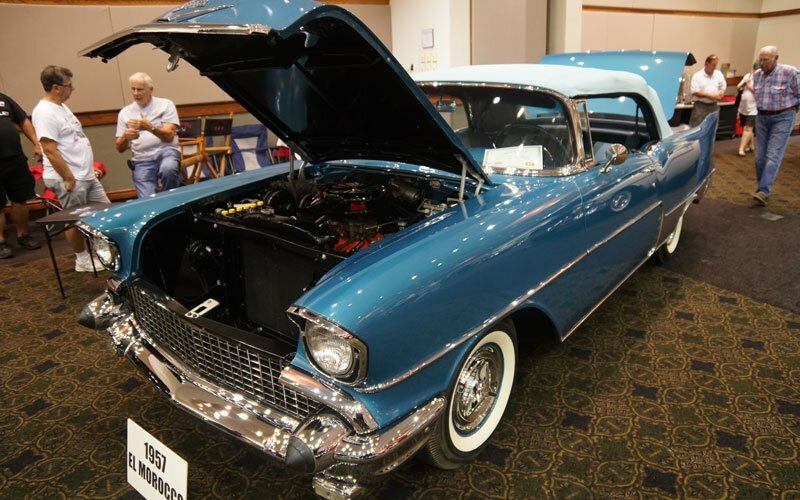 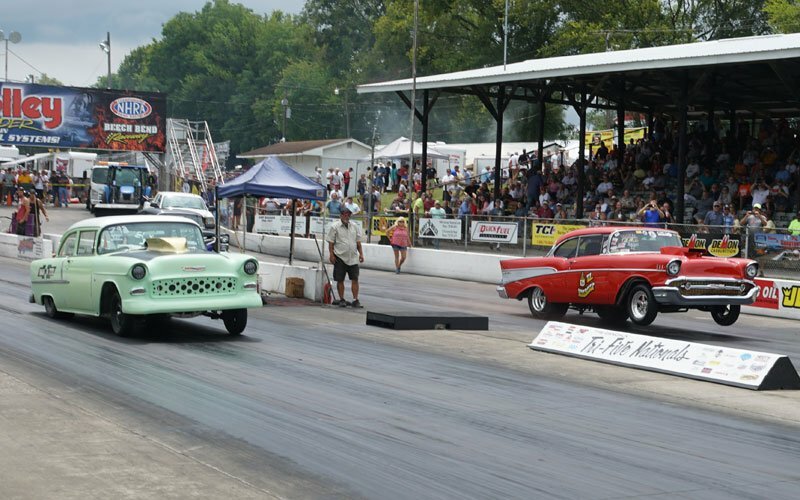 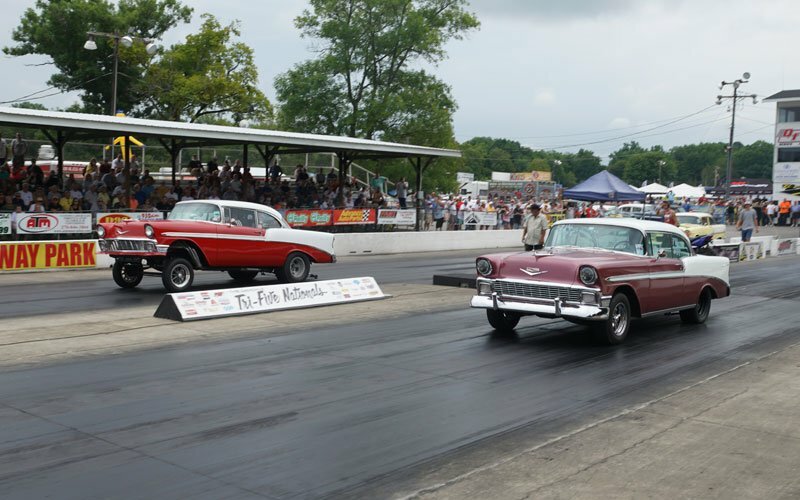 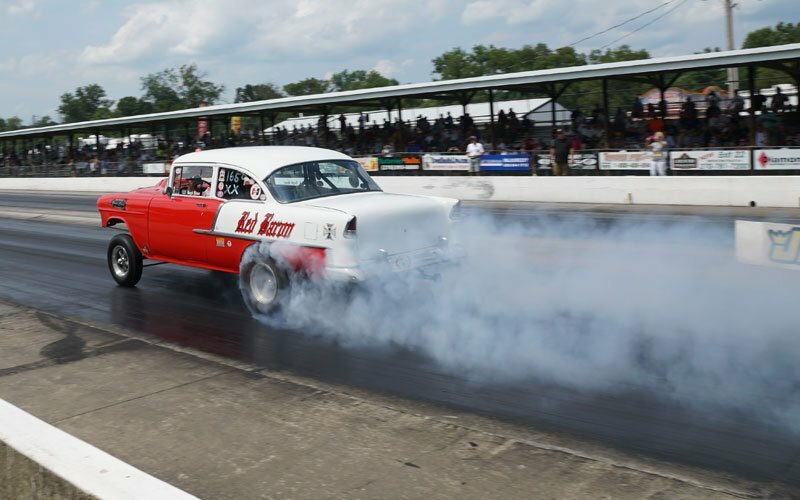 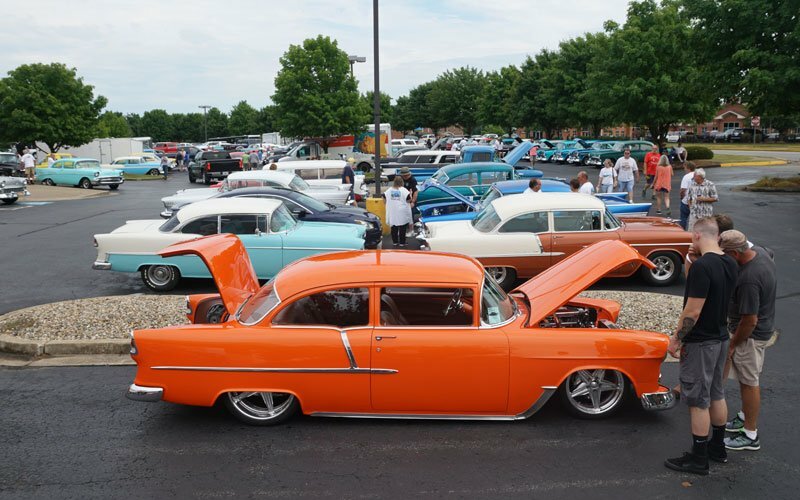 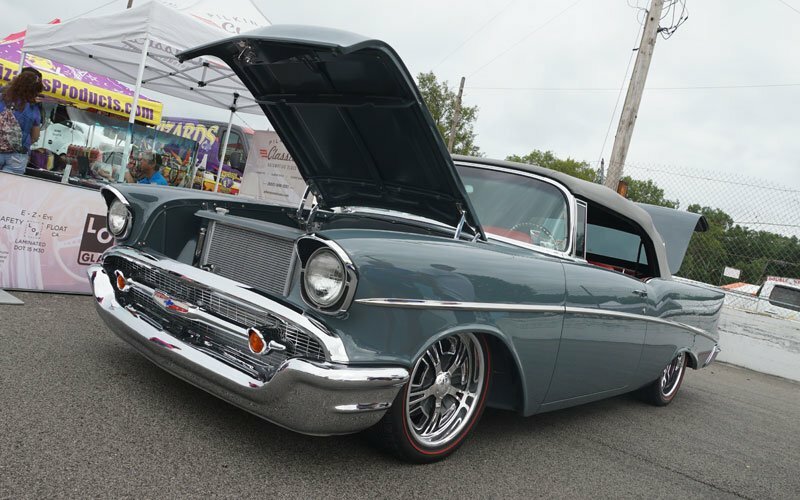 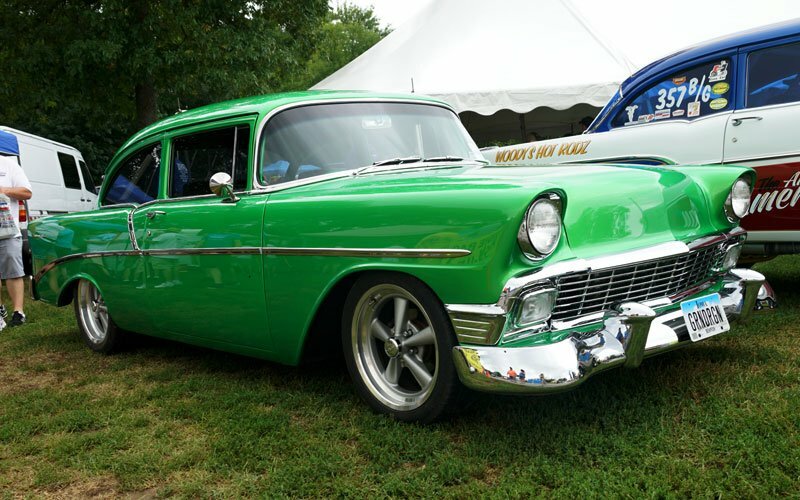 If you have a passion for ’55 to ’57 Chevy’s, then the Tri-Five Nationals 2018, August 9-11, 2018, is the place to be this weekend. 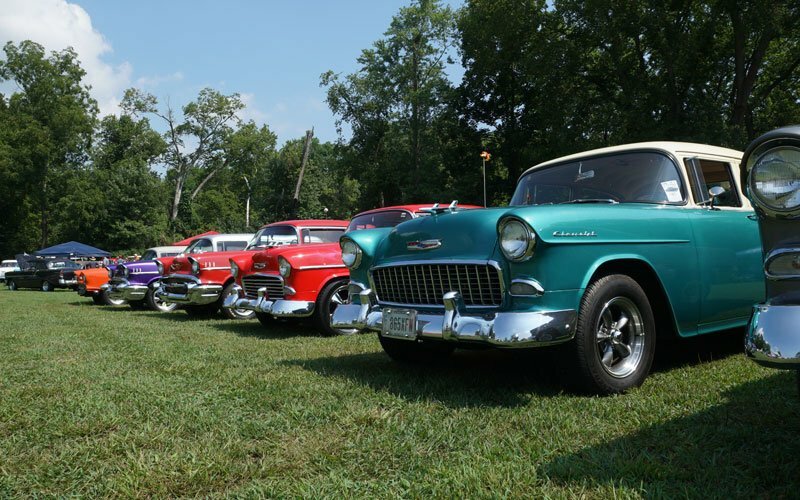 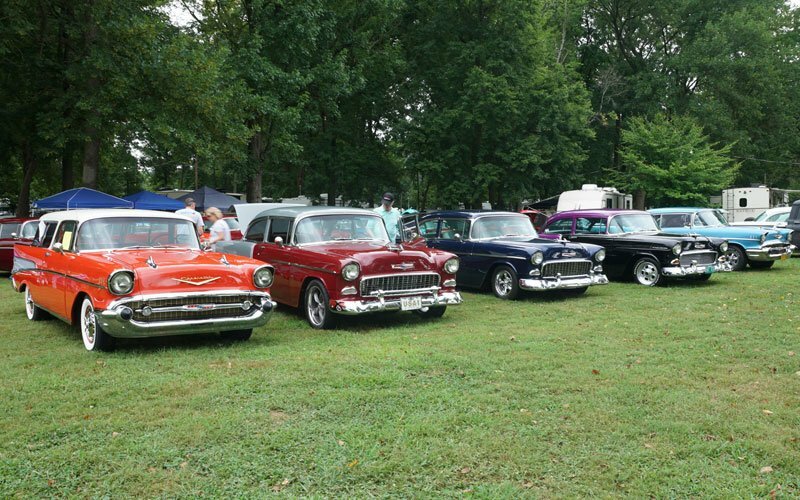 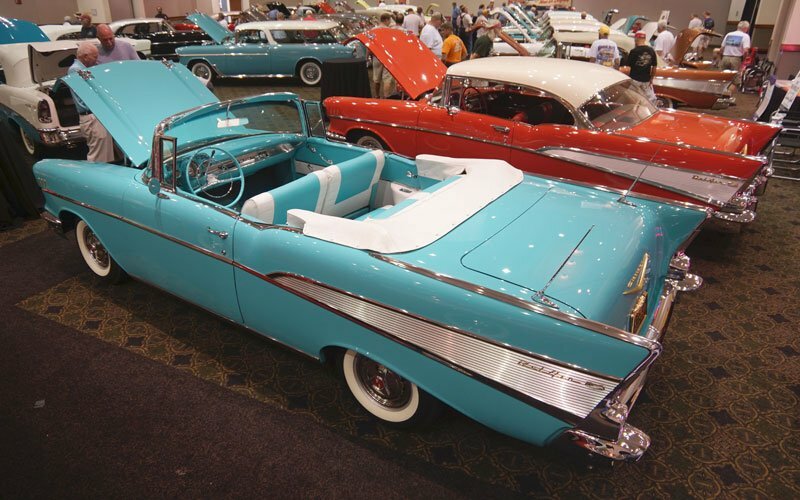 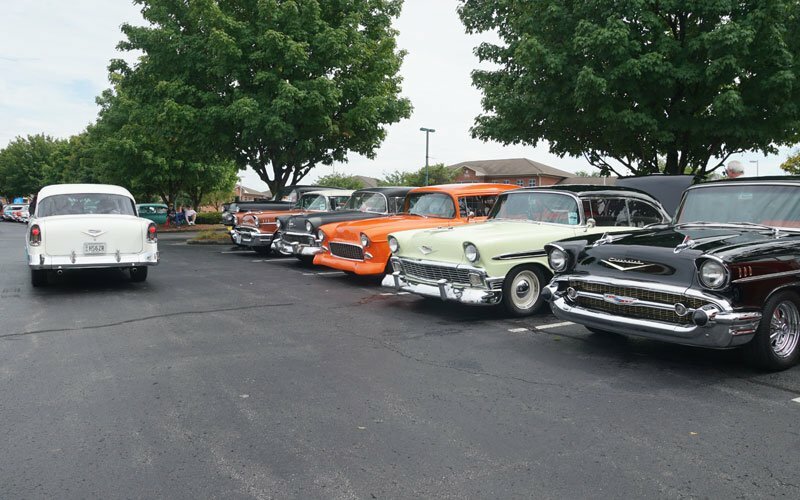 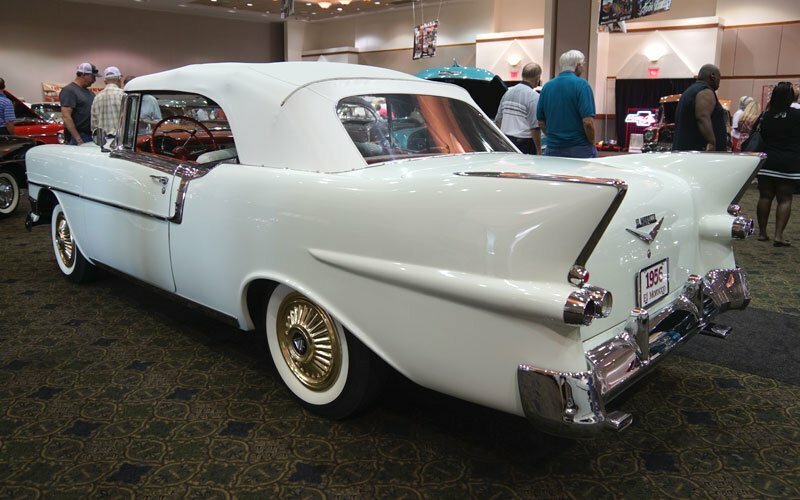 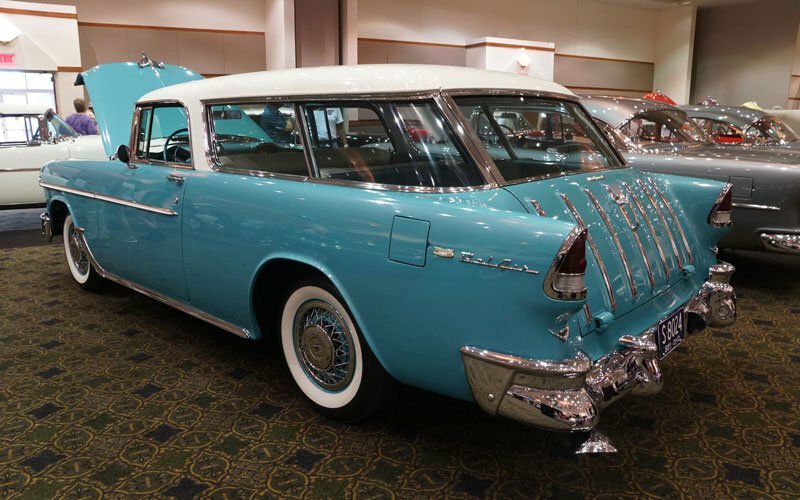 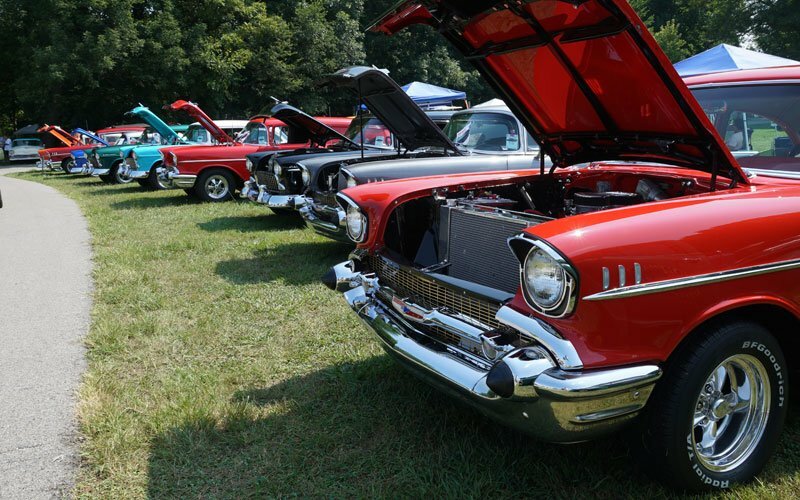 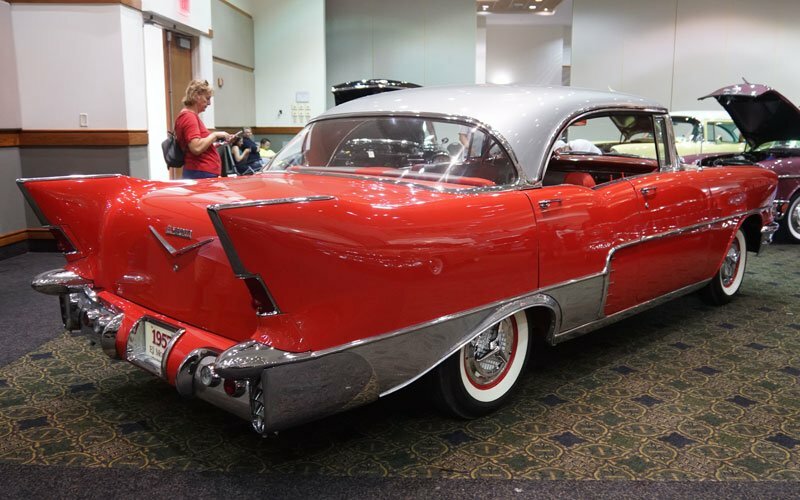 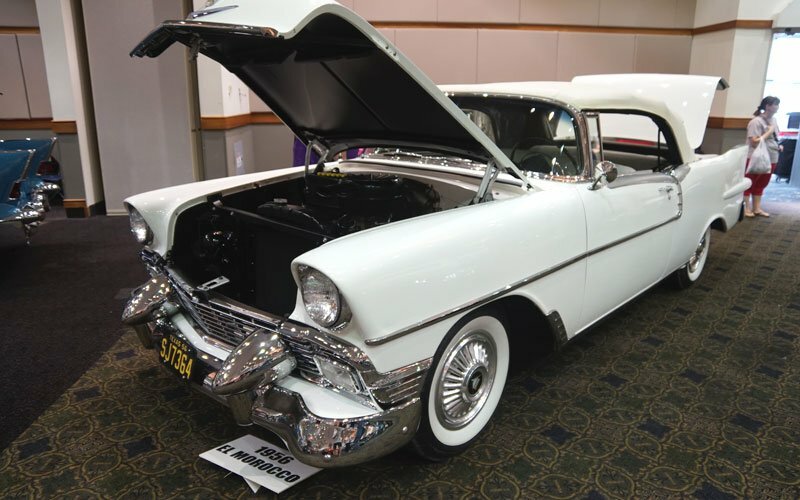 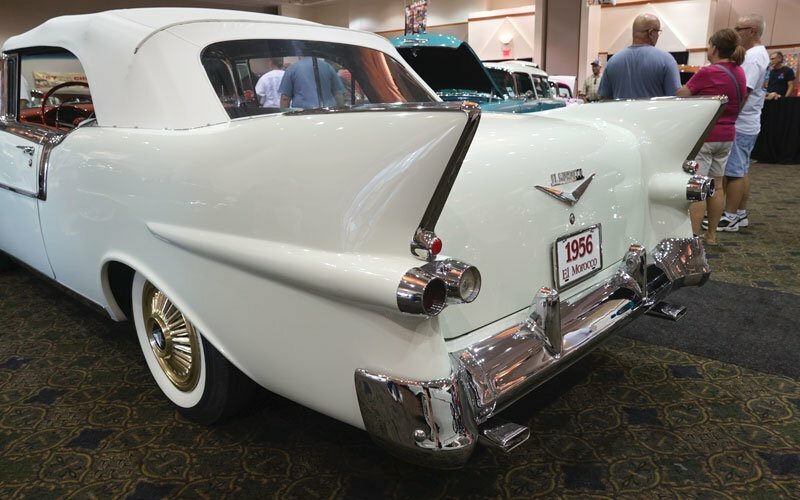 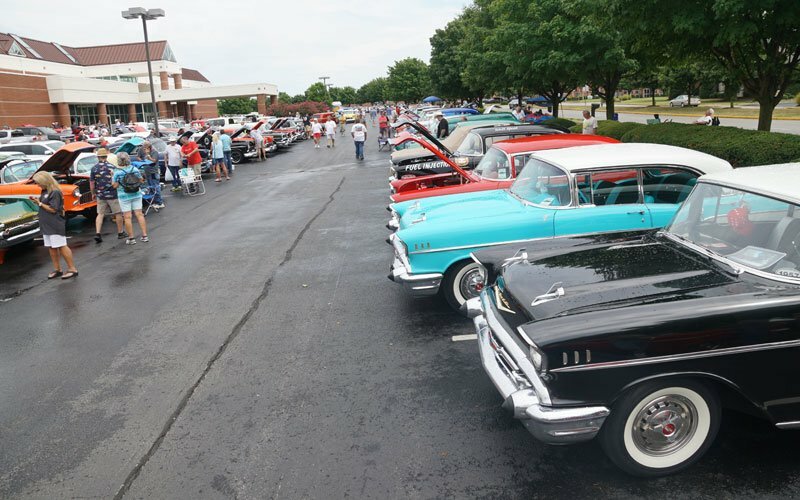 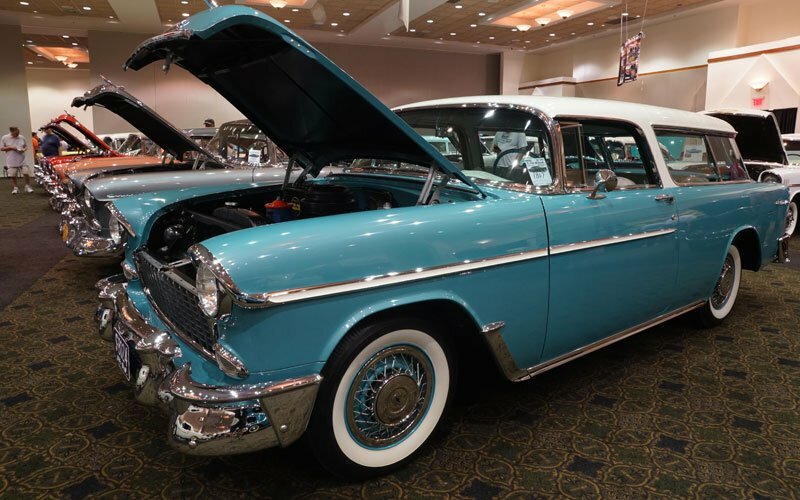 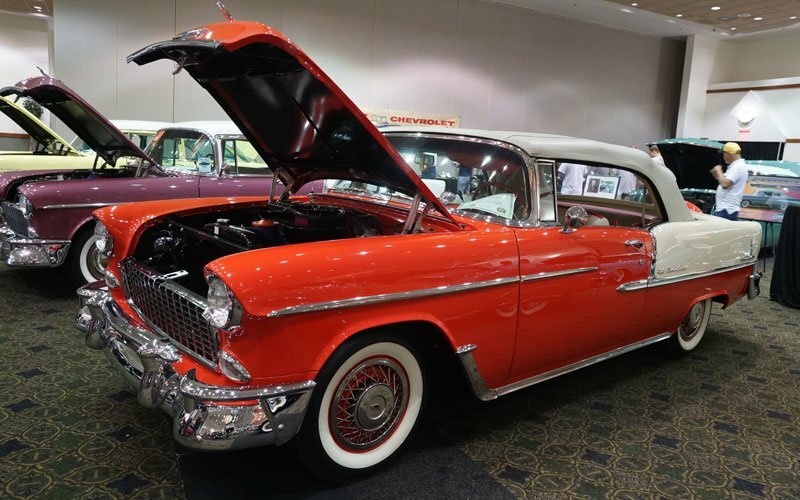 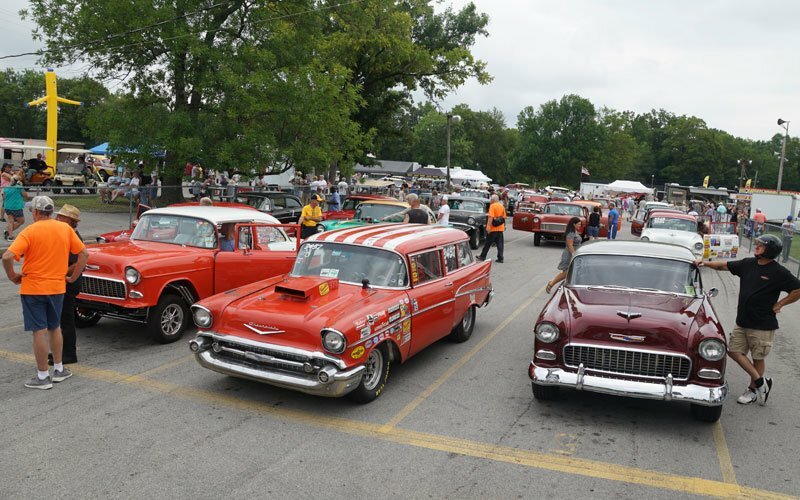 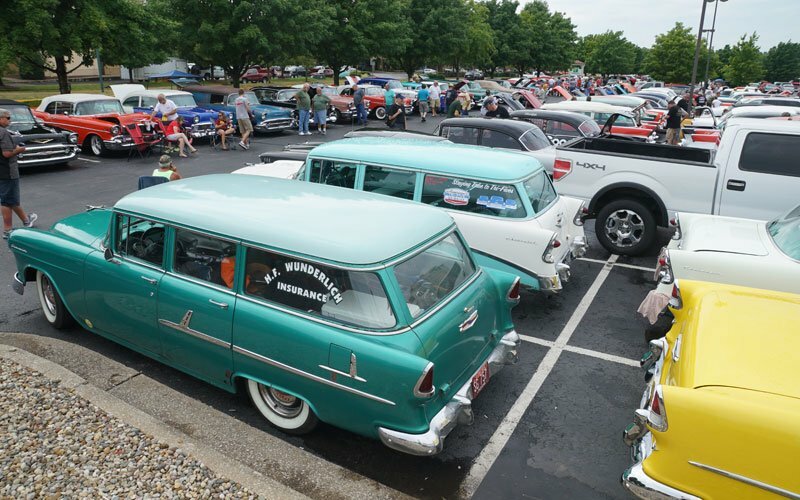 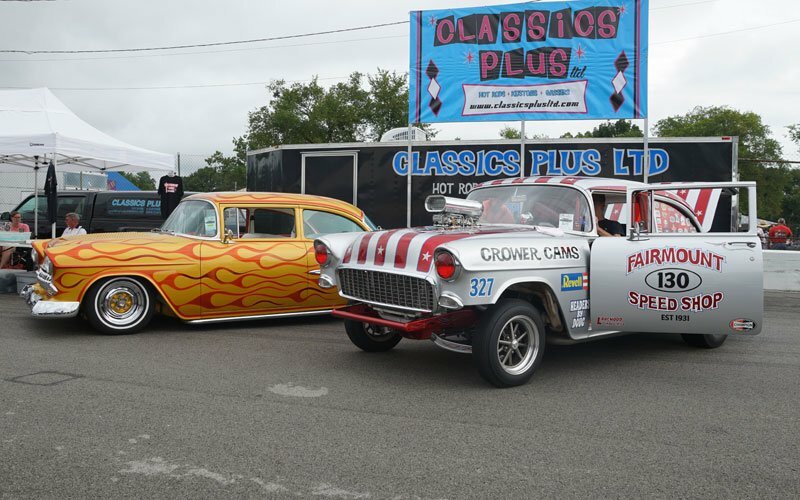 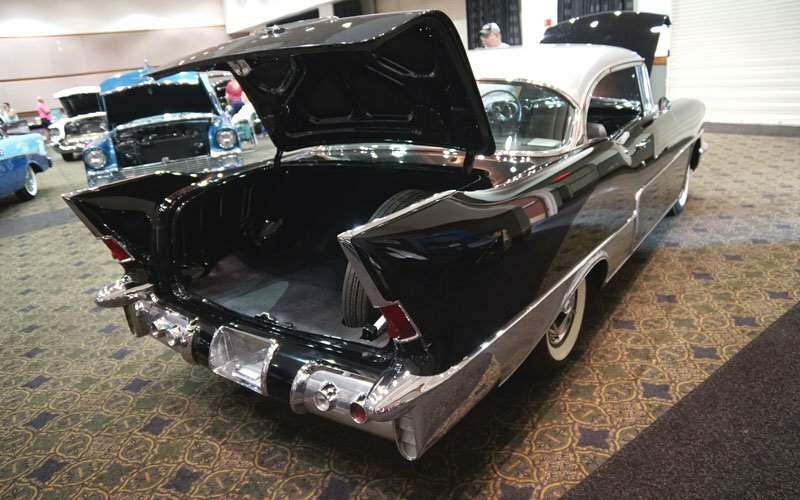 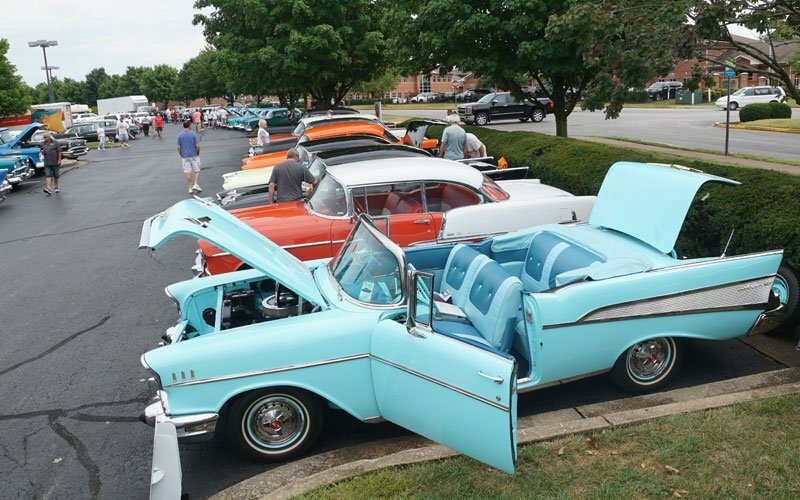 This event is a three-day celebration of 1955, 1956, and 1957 Bowties of all types – gassers, Bel Airs, Cameos, first generation Vettes, Nomads, and much more. 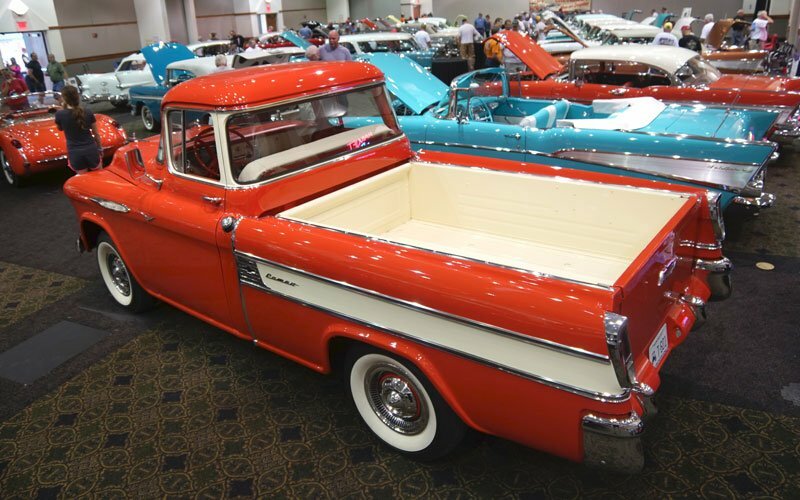 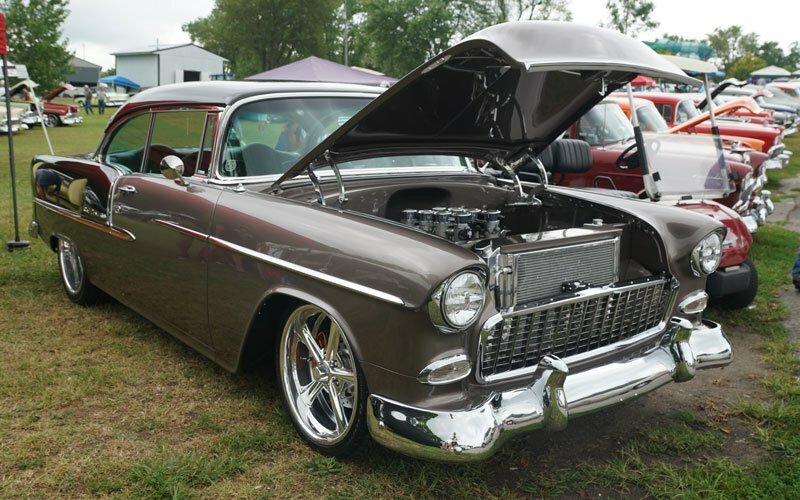 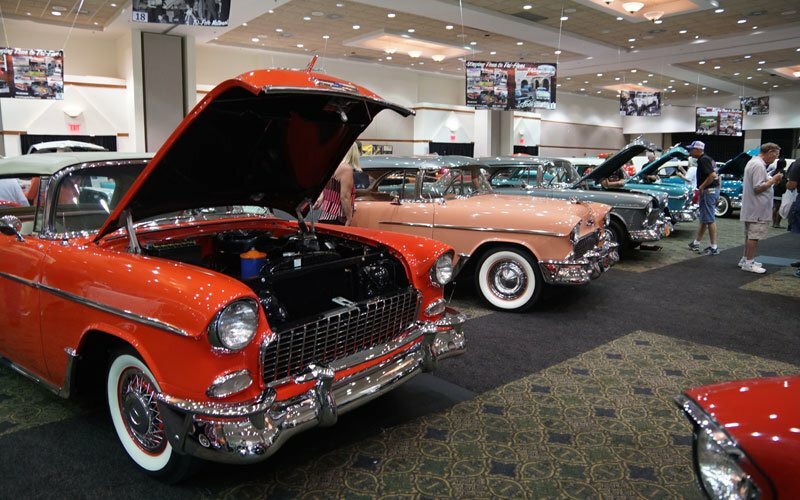 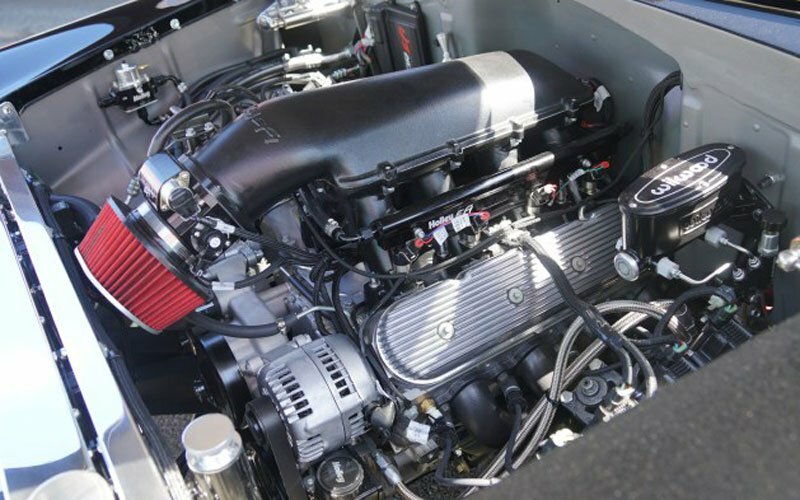 Only in its 4th year, the Tri-Five Nationals 2018 is an event every Chevy lover must put on their bucket list. 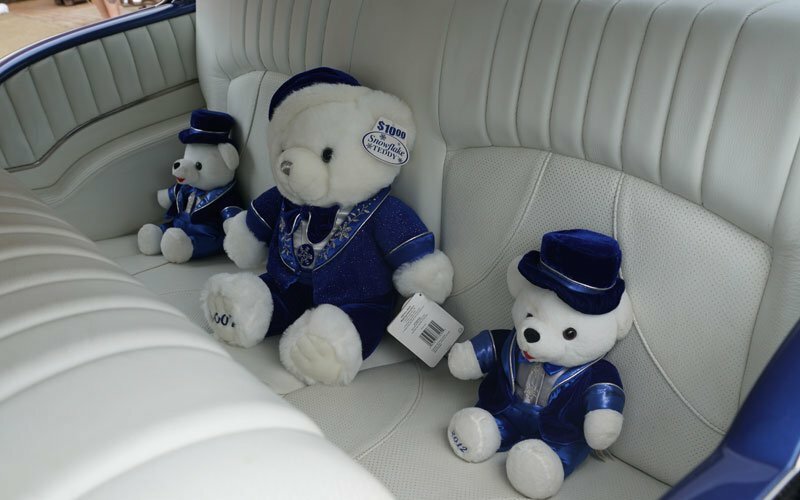 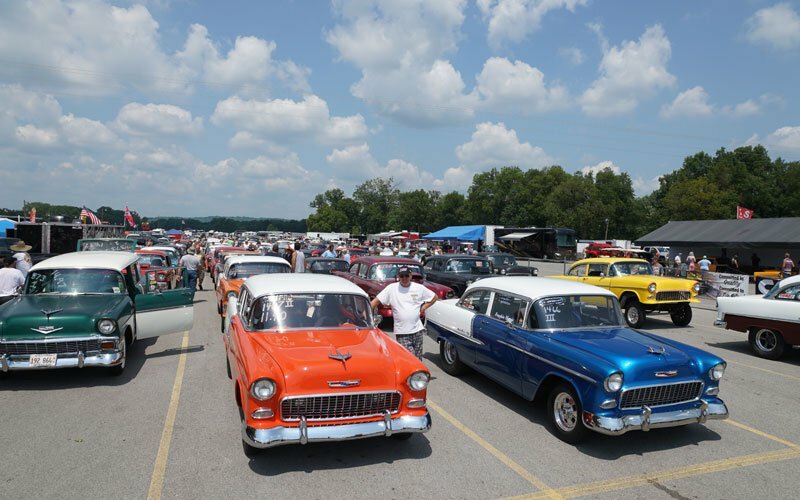 The Cars-On-Line Car Show team will be on hand here this weekend to capture the event in photos and video. 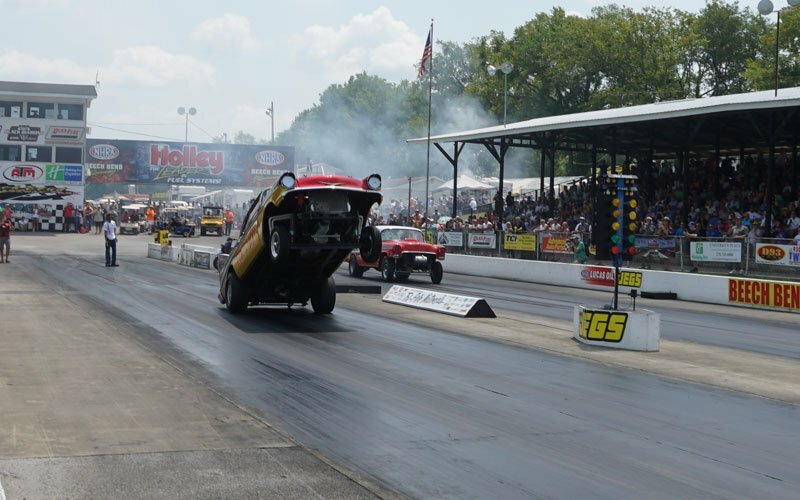 Danchuk and Woodys Hot Rods put on a great show here today. 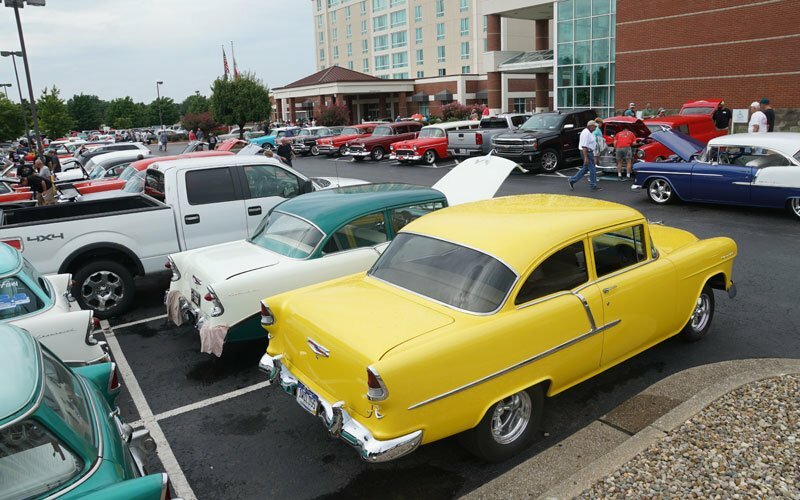 The total number of classic Chevrolet Tri-Fives registered for the event reached 2,752 today. 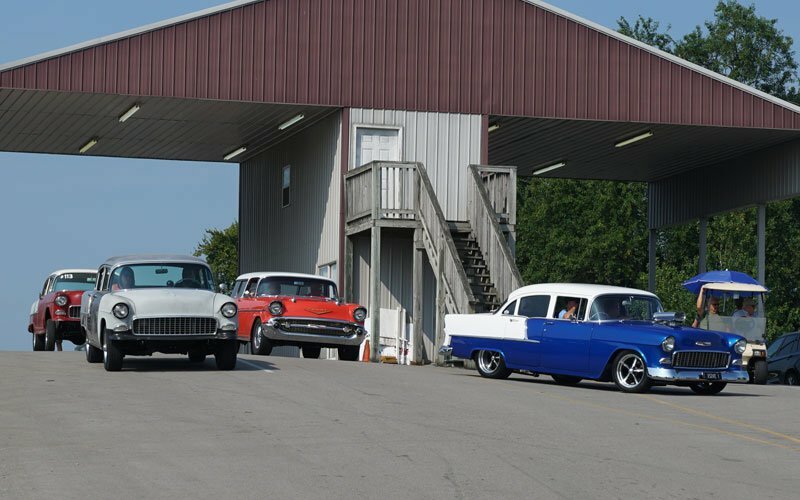 There was outstanding participation. 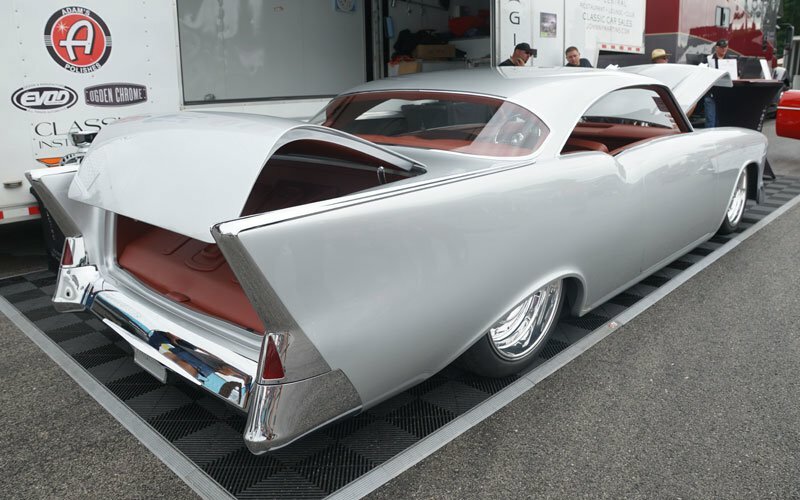 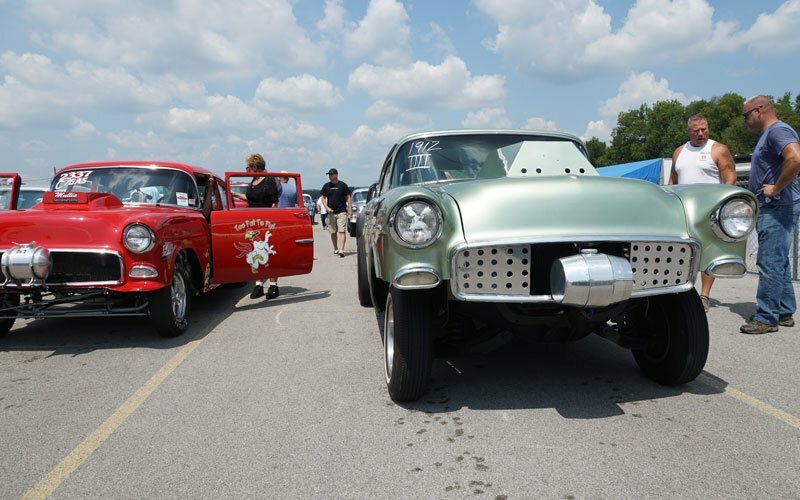 Here are some of the eye-catching Chevys that we saw at Beach Bend Raceway where the Tri-Five Nationals 2018 are being held. 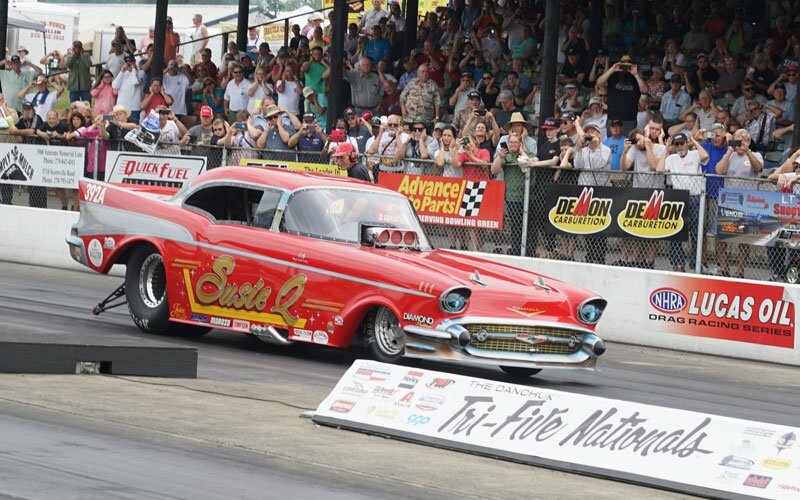 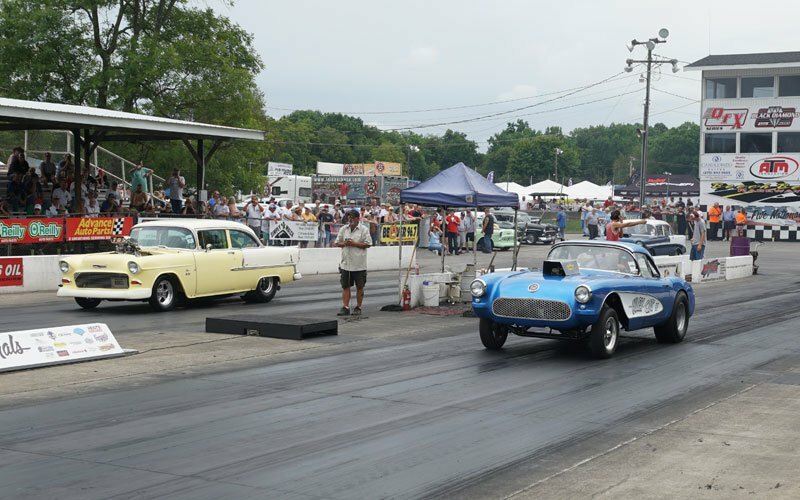 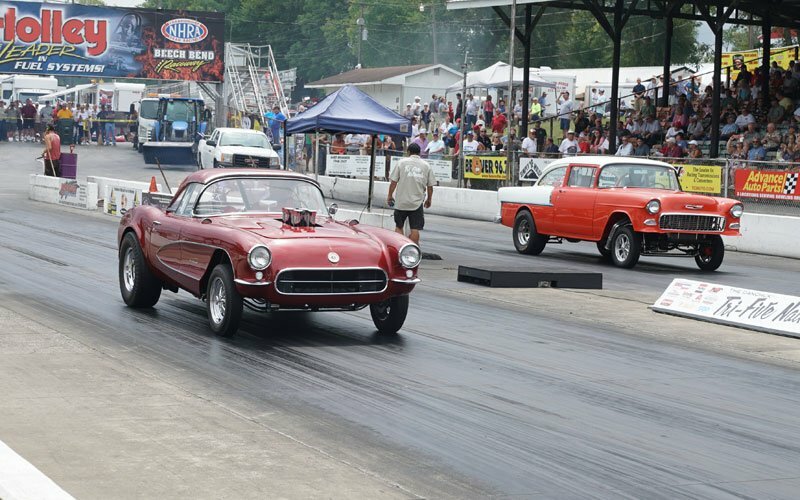 The Tri-Five Nationals 2018 opened on Thursday. 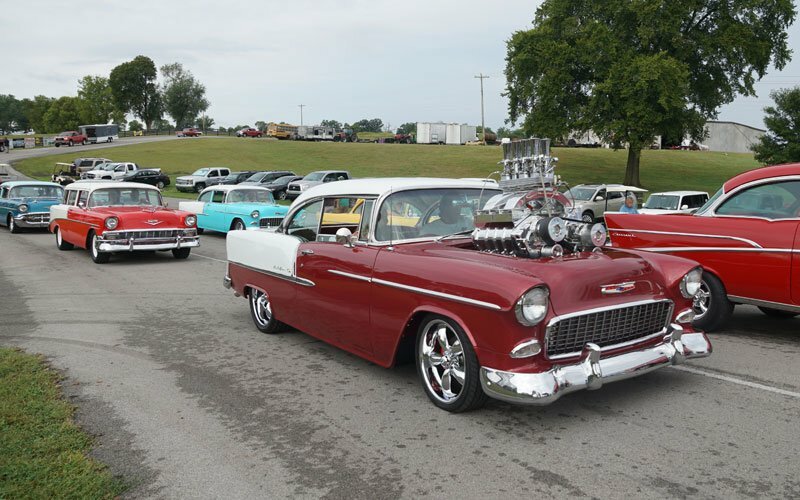 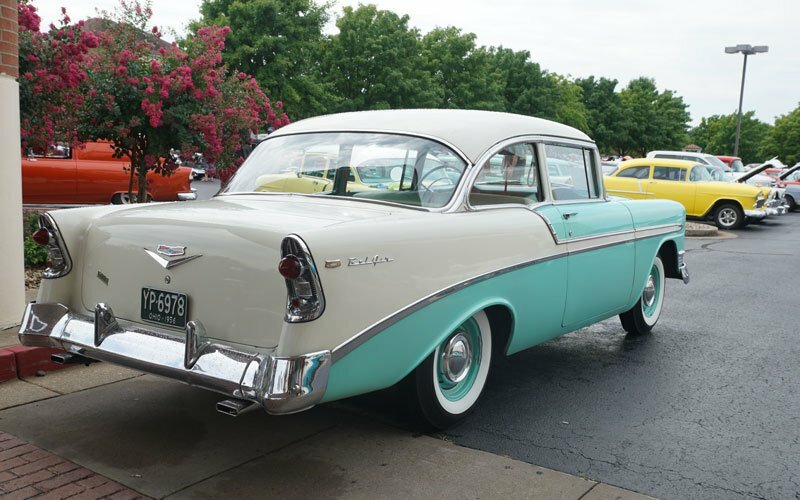 Bowling Green, Kentucky is packed with 1955 through 1957 Chevrolet classics. 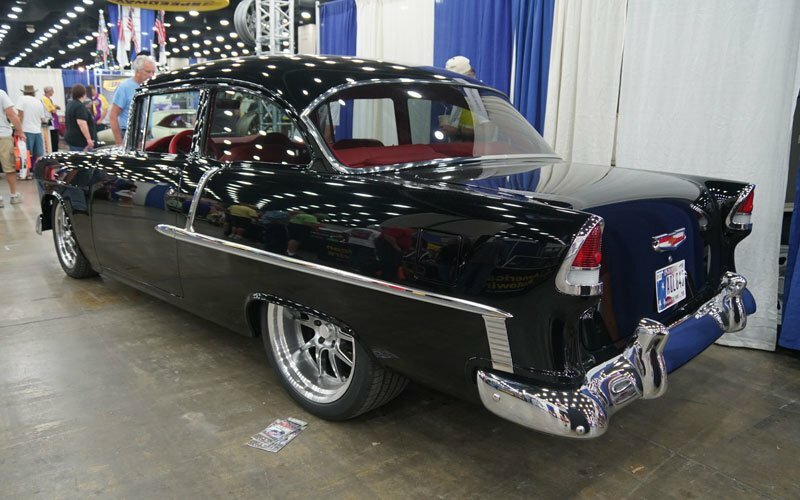 In the slider above you will note that this year’s Ridler Award winner from the Detroit Autorama was on hand. 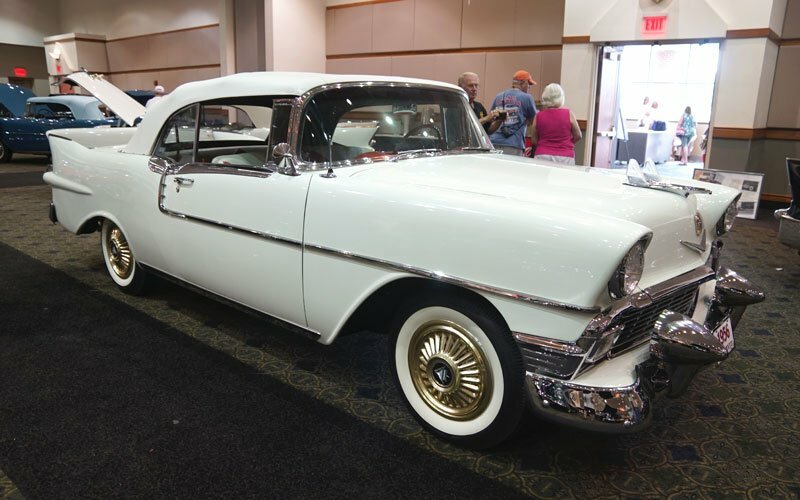 The 1957 Chevy 150 Hardtop owned by Greg & Judy Hrehovscik and co-owner Johnny Martin of Johnny’s Auto Trim & Rod Shop, Alamosa, Colorado was displayed here. 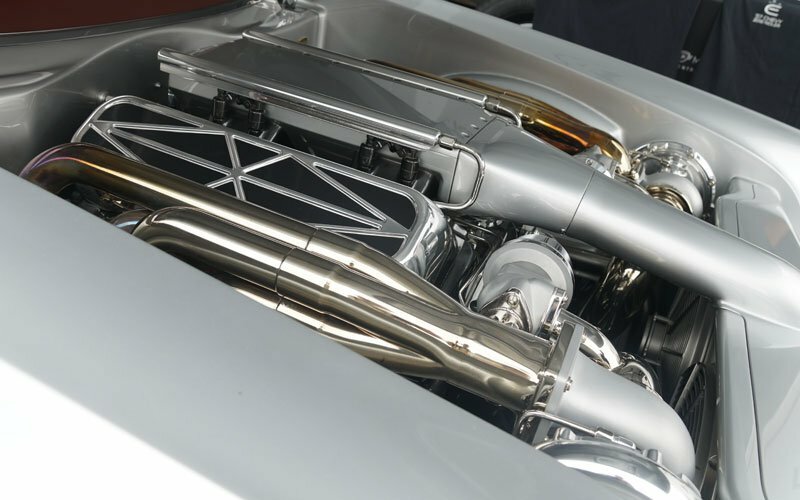 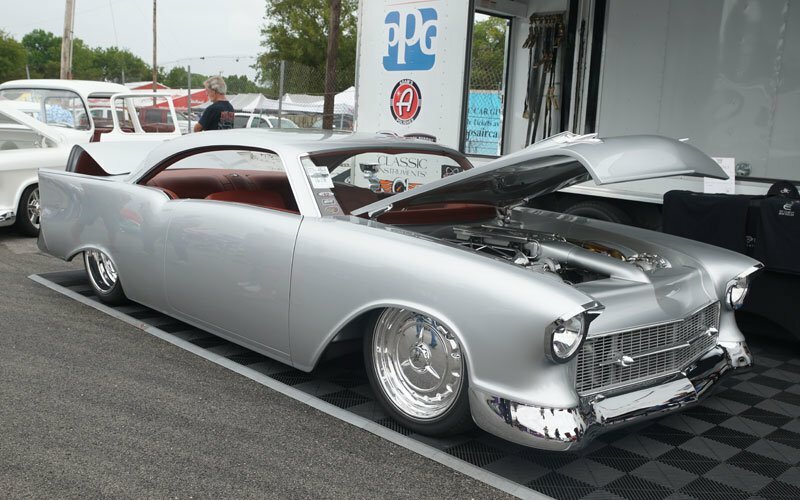 Click this link to review our coverage of the Ridler Award announcement in Detroit earlier in 2018. 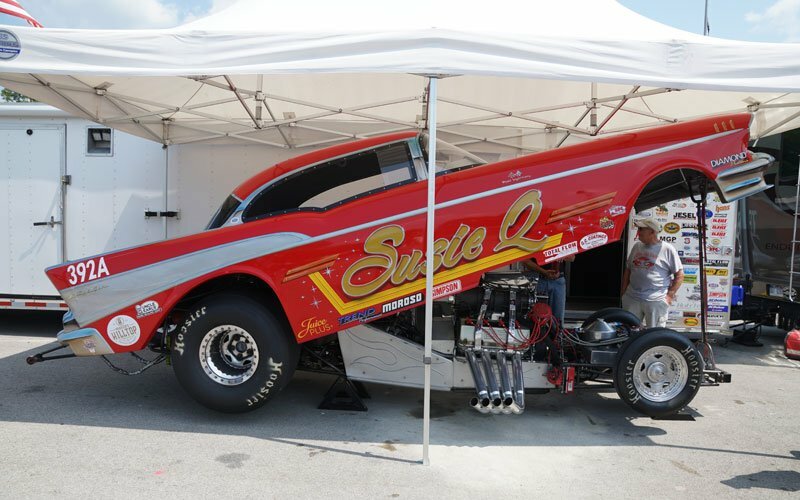 Be sure to watch for our posts on Facebook and Twitter, and bookmark this page to see the action in real time as we shoot it. 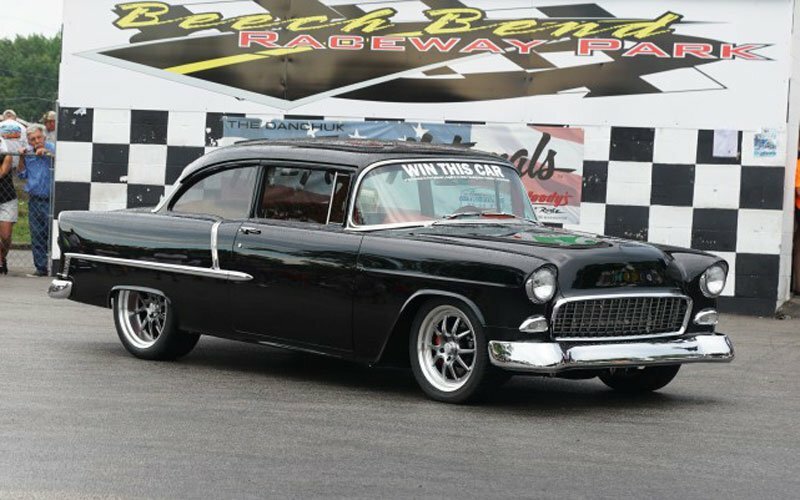 Philip Reedy of Pensacola, Florida is the lucky winner of the 2018 Tri-Five Nationals Gold Star Give Away car. 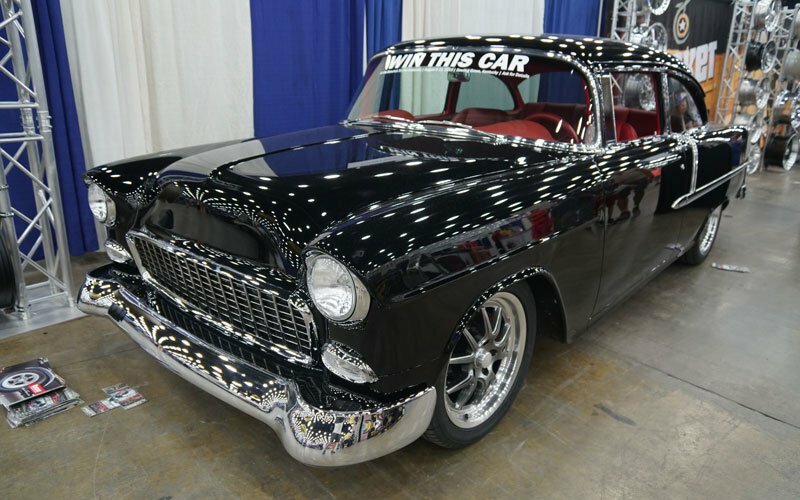 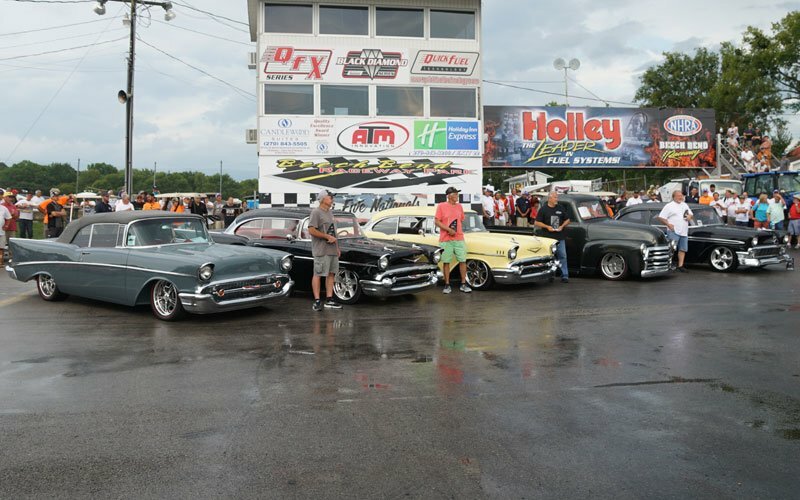 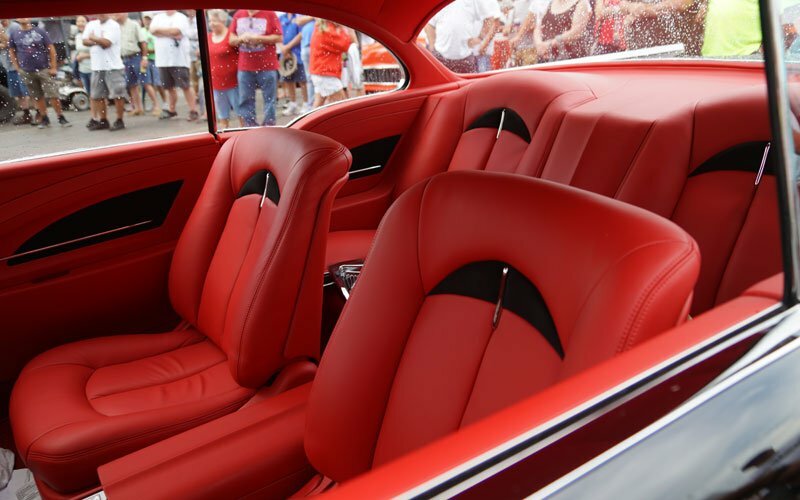 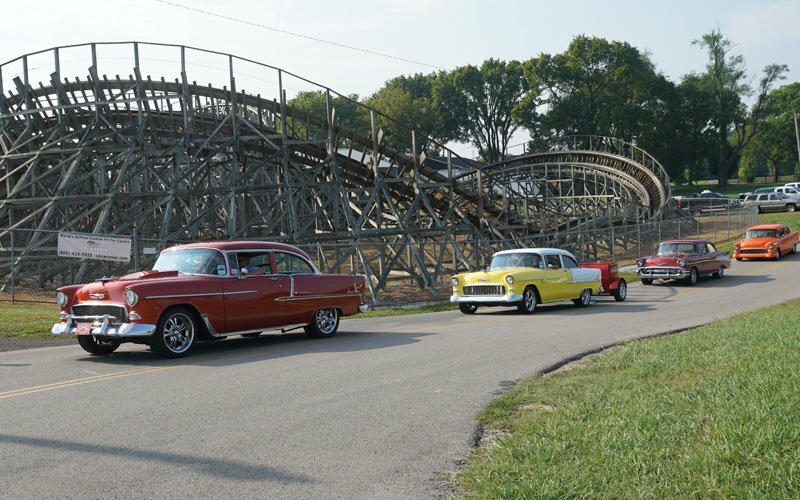 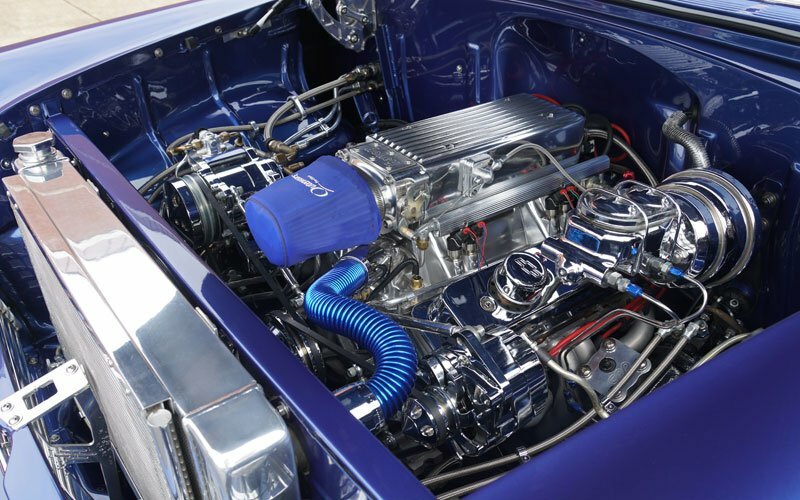 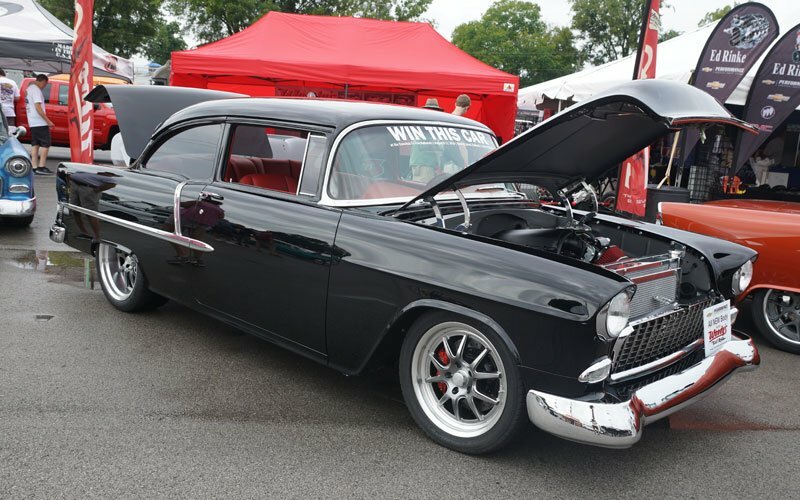 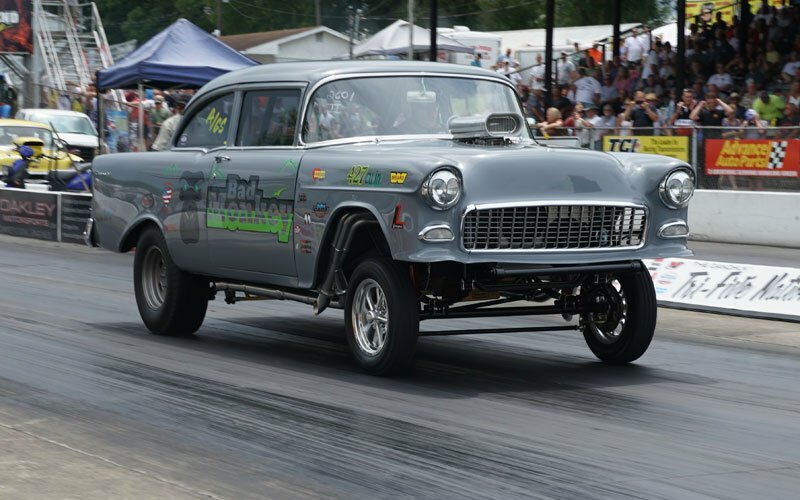 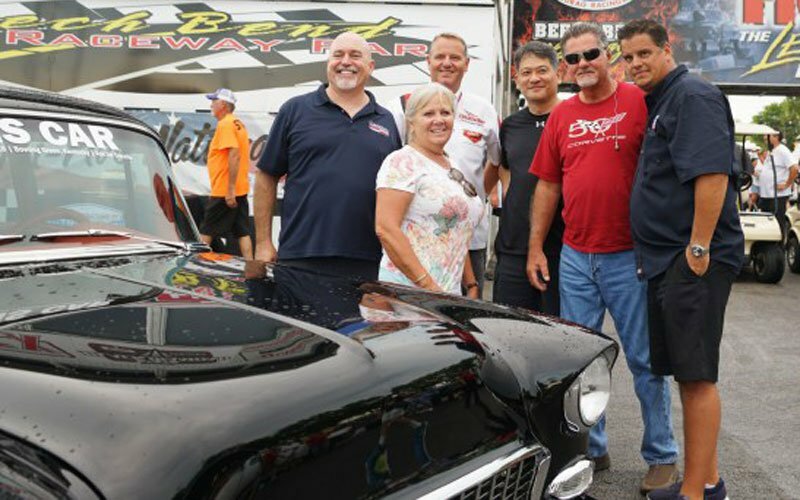 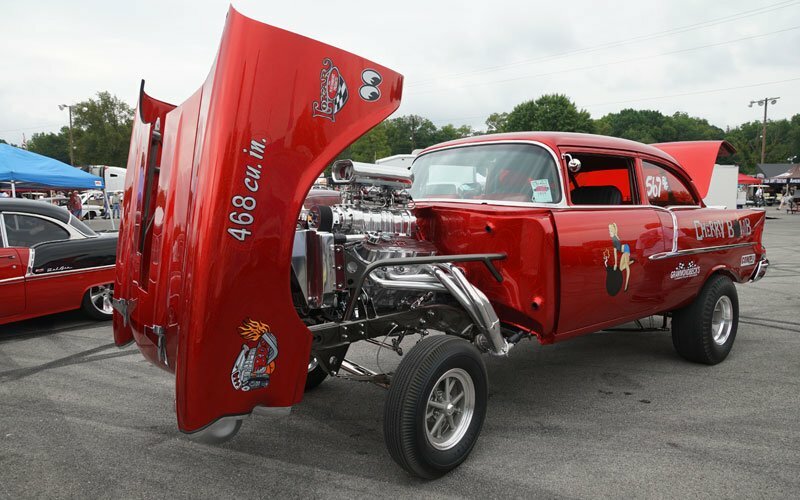 Each year, a car built by Woody’s Hot Rods is given away to one of the lucky participants in the Tri-Five Nationals. 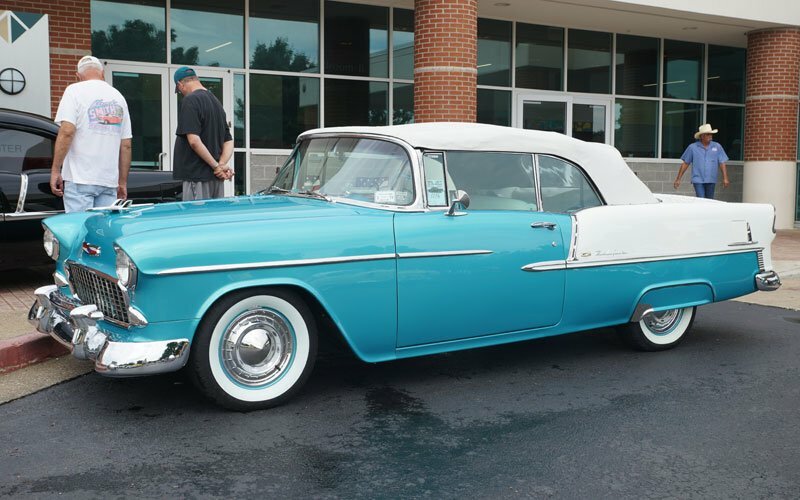 Reedy’s registration ticket number as a particpant of the show was drawn and he won the beautiful 1955 Chevrolet classic custom shown here in the photos. 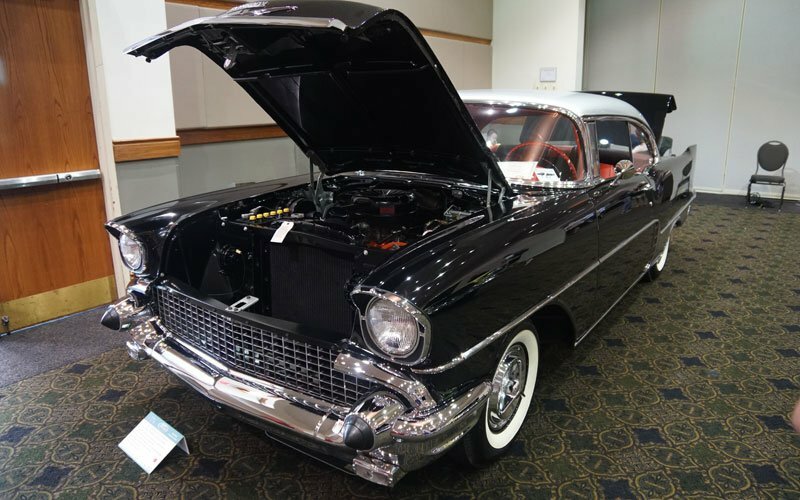 In the Sloan Convention Center in Bowling Green, where they had the registration for the Tri-Five Nationals 2018, we found this incredible display they call the Heritage Collection. 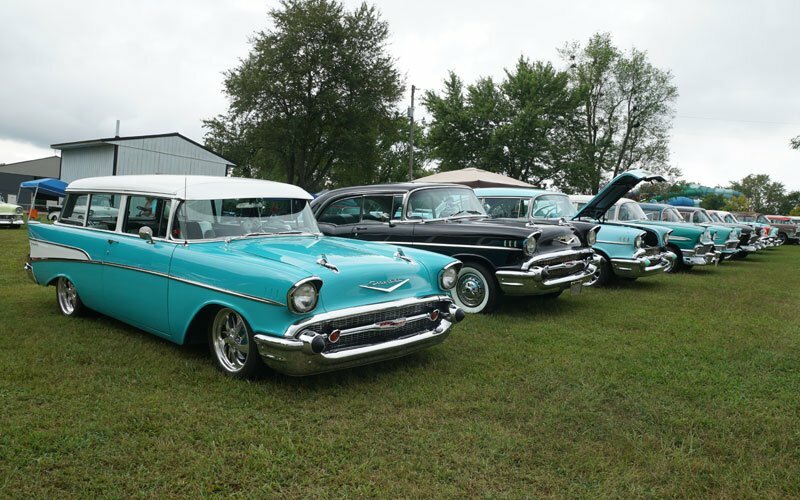 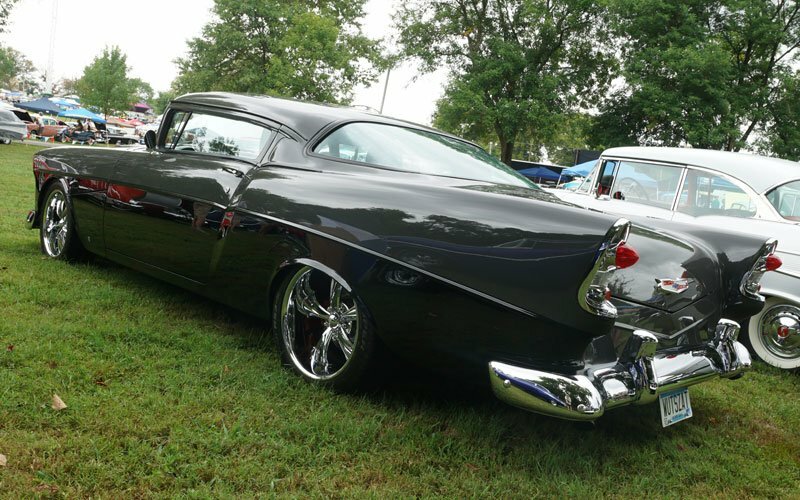 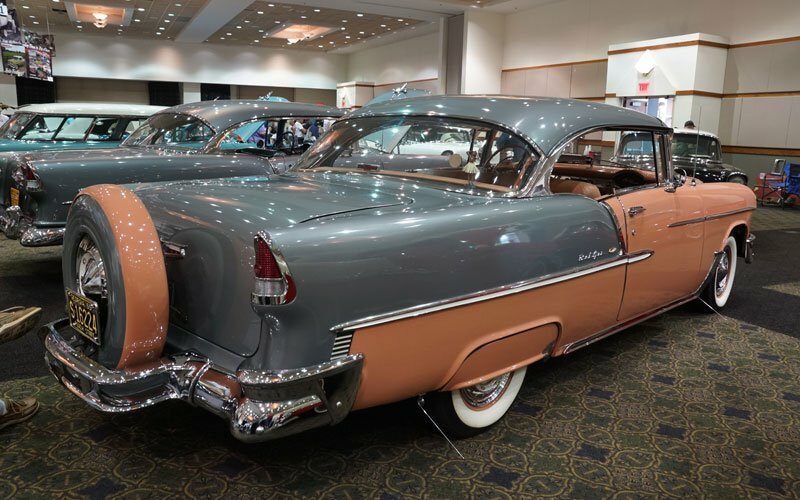 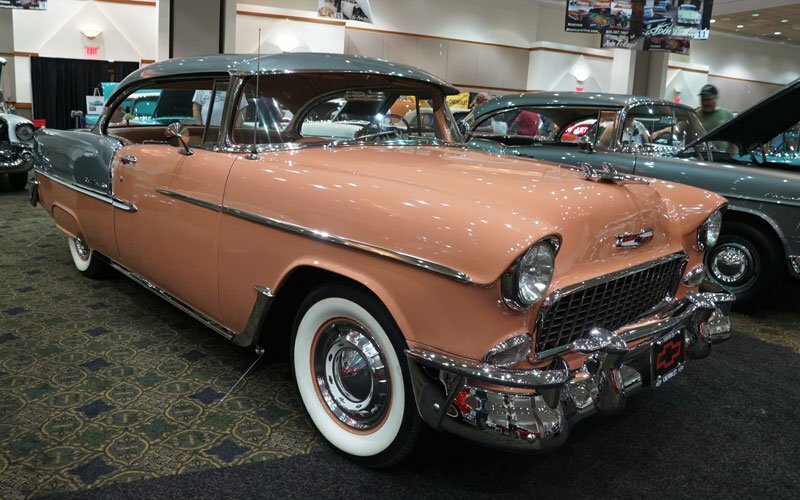 These are some of the rarest and most beautiful 1955 through 1957 Chevrolet examples we have ever seen. 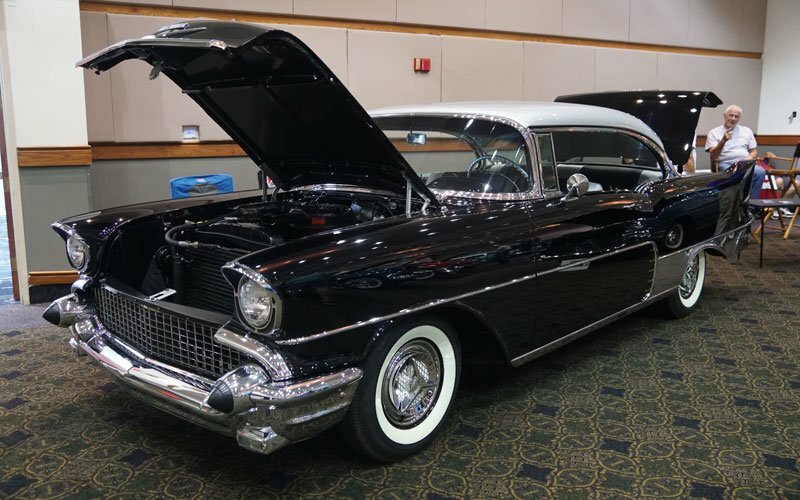 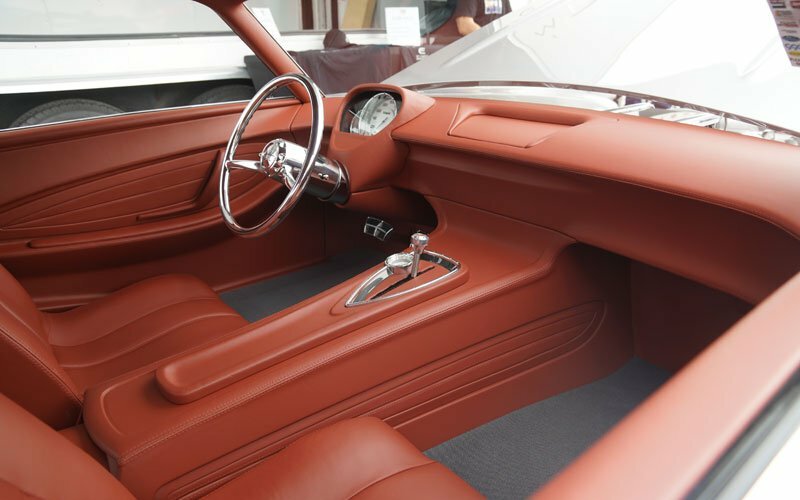 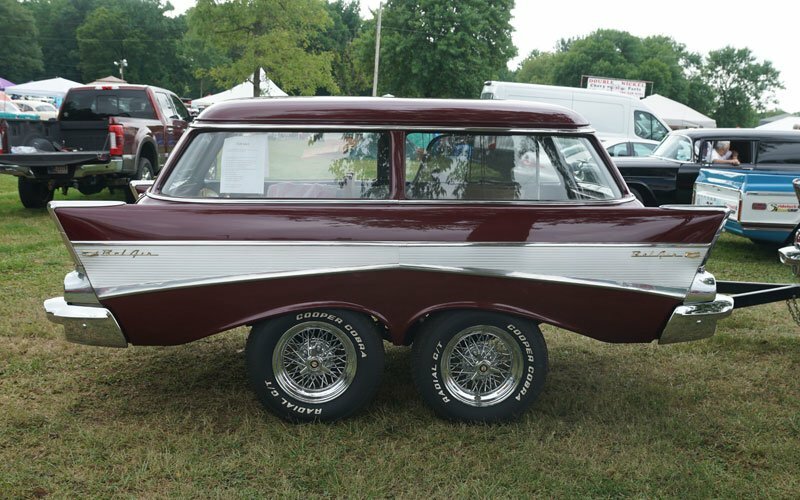 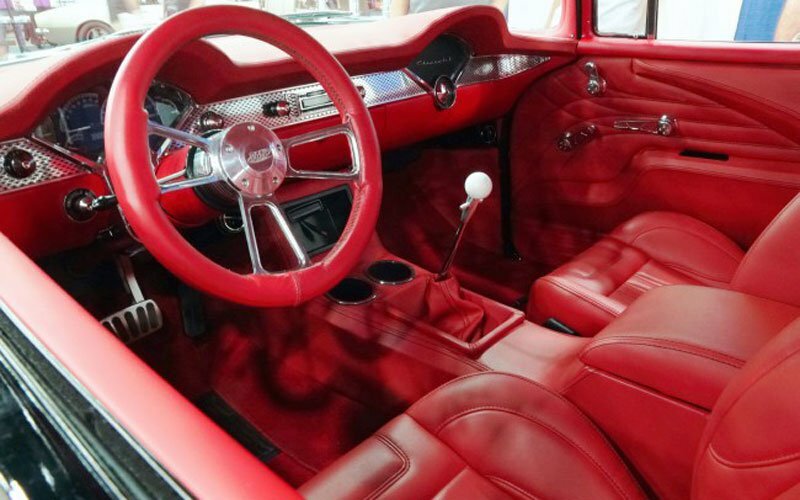 They even had seven of the ultra rare 1956 and 1957 Chevrolet El Morroccos, aftermarket conversions done by Ruben Allender, a Detroit entrepreneur. 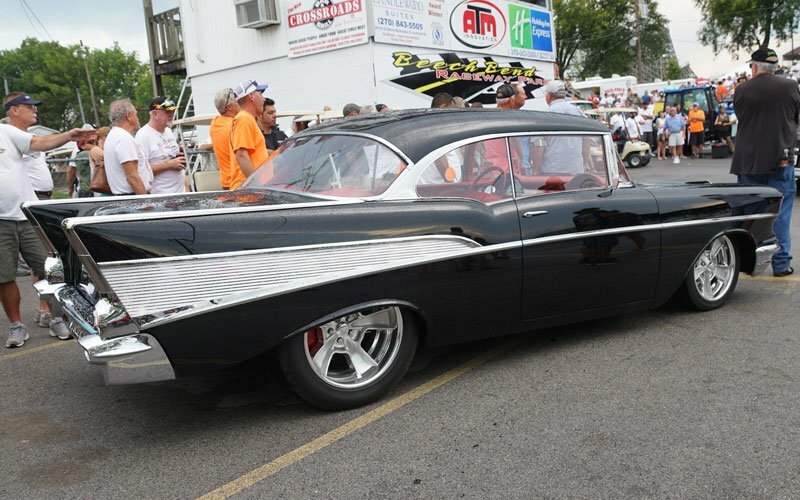 Allender took Chevrolet Bel Airs and made them look like Cadillacs. 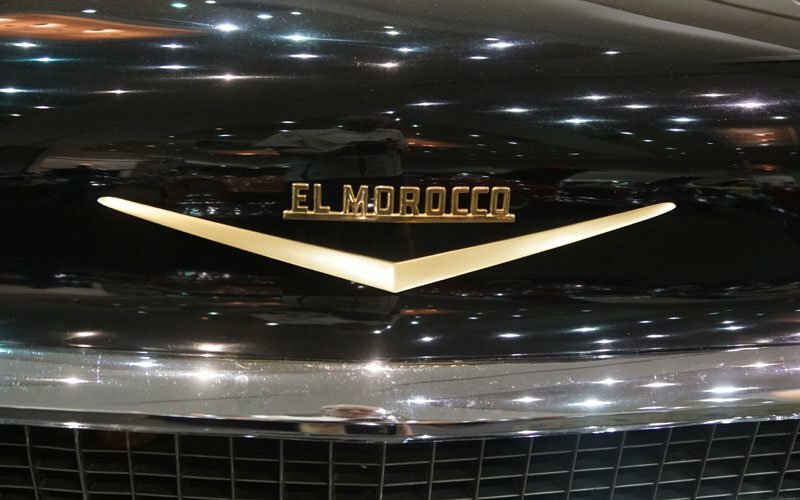 Although this concept never really caught on, today these El Moroccos are incredibly valuable as collector items. 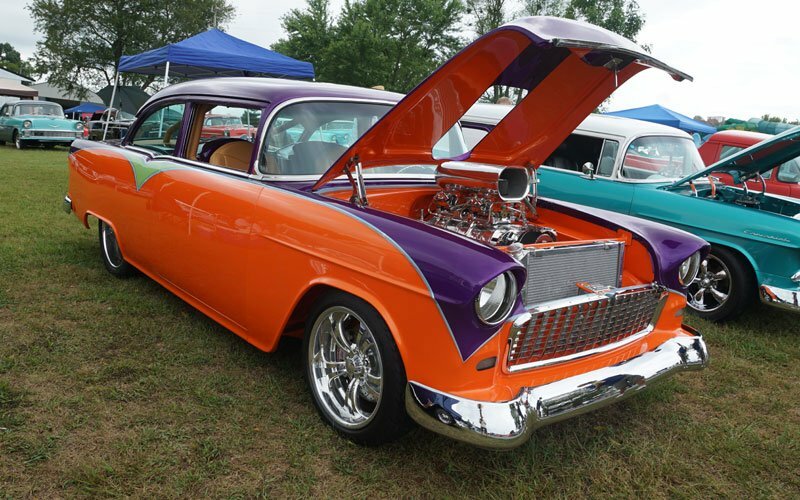 Here is a rare look at the El Moroccos in the Heritage Collection. 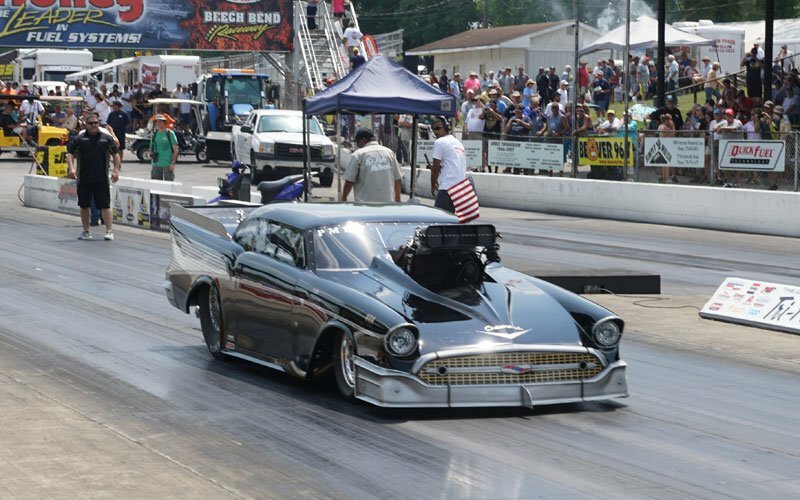 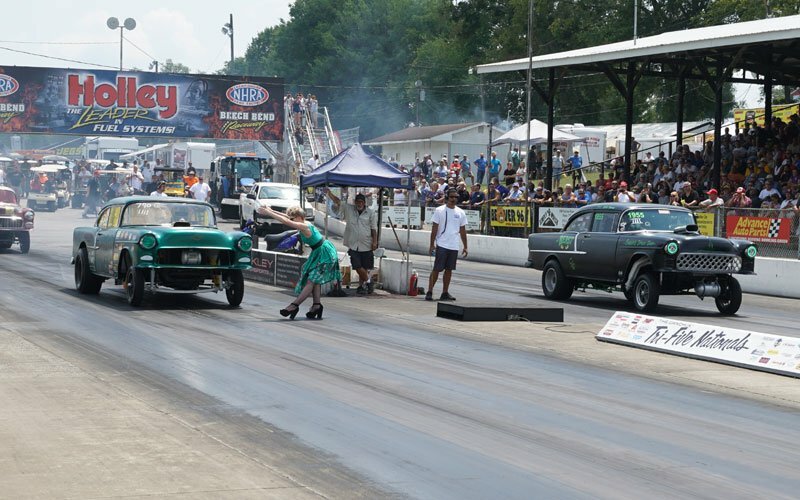 In addition to the amazing number of Bowties on the show field, there was plenty of drag racing action during the three-day event. 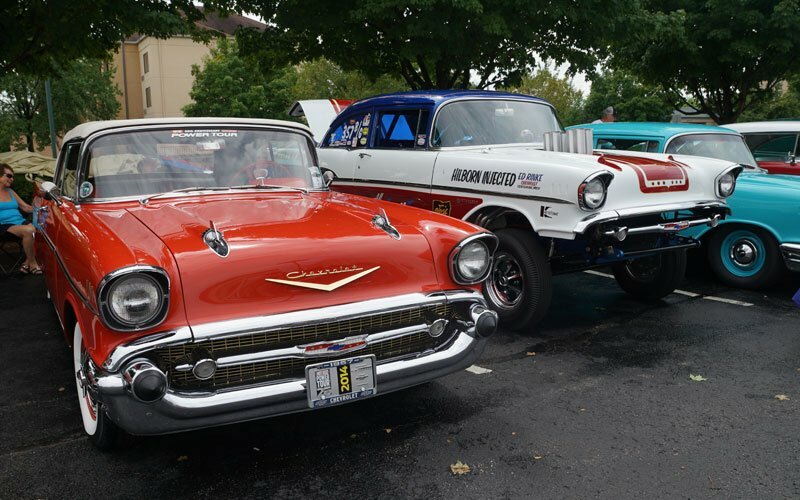 It was quite a sight, as these Chevys performed burnouts and ran the quarter mile. 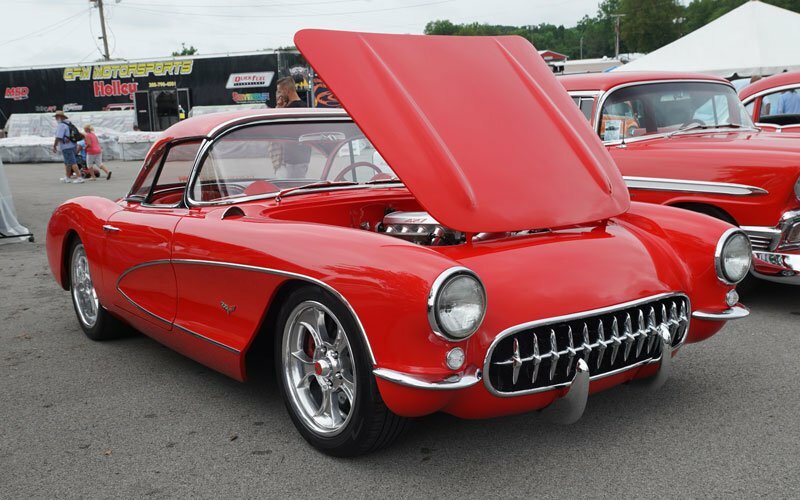 Some really beautiful machines. 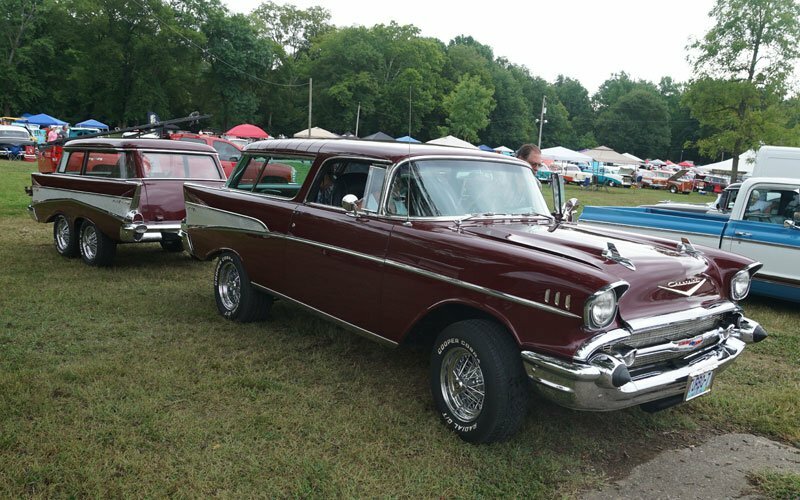 Back in ’64 I owned a ’56 210, six cylinder with a three speed on the column. 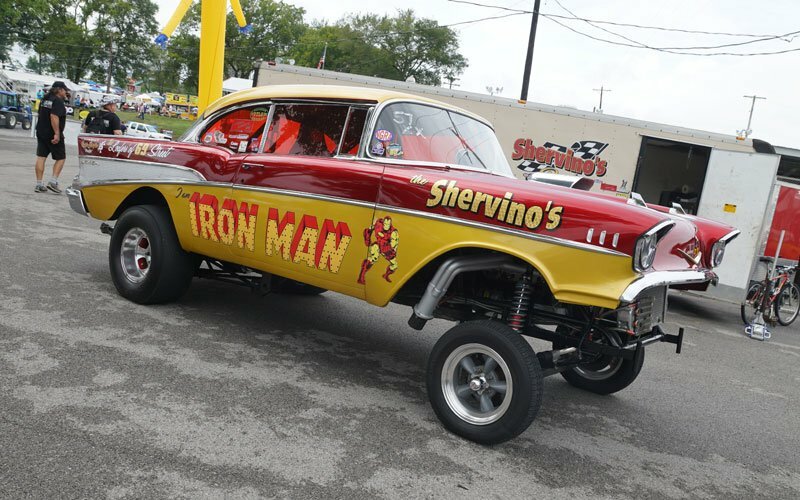 Had fun with it!